Geneva, Switzerland is a beautiful cosmopolitan city, in an equally gorgeous and remarkably clean country. Switzerland has an amazing culture and history, which is famous for creating many world-famous industries including Swiss Chocolate, Swiss Cheese; Fondue, Swiss Banks, Skiing in the Swiss Alps, and even the Swiss Army Knife. Switzerland is also the place where Albert Einstein, in 1905, which was known as his Miracle Year, wrote four of his famous equations, including his Theory of Relativity, and his Special Theory of Relativity. The Swiss are also known for being neutral, which has significantly contributed to Swiss diplomacy. Thus it is no coincidence the precursor to the United Nations, known as the League Of Nations was founded in Switzerland and today is known as the United Nations Office At Geneva. Switzerland also has an amazing scientific community that includes Geneva University and CERN, which is one of the top research institutes in the world and is home to the world's largest particle physics laboratory. Also, the International Red Cross was founded and is still headquartered in Switzerland. Switzerland perhaps is best-known for its watch industry, which is immense, and at the top of the Swiss watch industry is one company–Rolex. 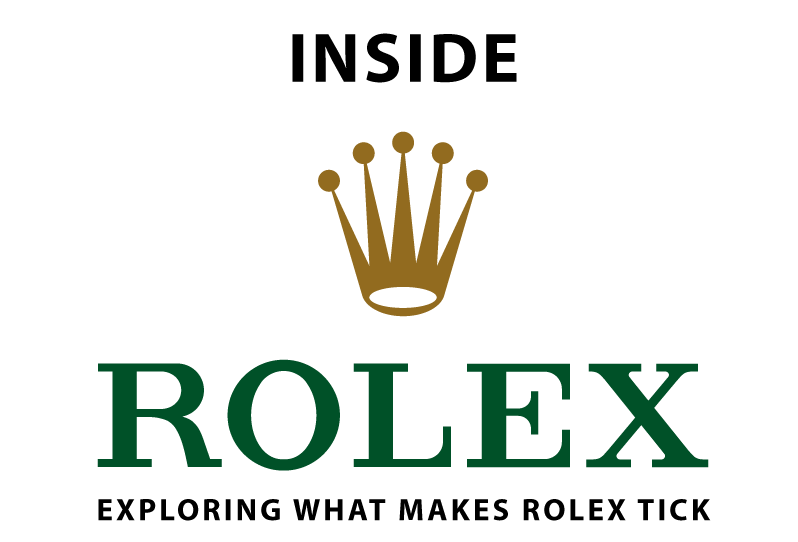 Today Rolex is one of the most respected and internationally recognizable brands. This story will take you on an unprecedented tour inside Rolex to understand what makes Rolex tick. I must begin by thanking Rolex for inviting me to be one of the first writers to tour all four of Rolex's world-class manufacturing facilities, as well as touring their world headquarters. The two most fascinating top-secret places in the world most people today would want to visit, would likely be Jonathan Ive's Industrial Design Studio at Apple in Cupertino, California and Rolex's manufacturing facilities in Switzerland. The thing Rolex and Apple have in common, beside both being five letter names, is they are both intensely private and discreet, and both companies have cultures that care tremendously about their work-product and customers, and they both seek simplicity in a positively over-engineered way. What is the main difference between Rolex and Apple? Rolex designs and makes their own product in their own factories in Switzerland, and Apple does not, thus, making a tour of the inside of Rolex more holistically fascinating. Also, Rolex has been in business since 1905, where Apple has been in business since 1976. I have been publishing Jake's Rolex World as an Online Magazine since May of 2008, and I originally began writing about Rolex because I have been madly-in-love with the brand since I was 16 years old. I bought my first Rolex Submariner, 31 years ago, when I was 16 years old, back in 1982. 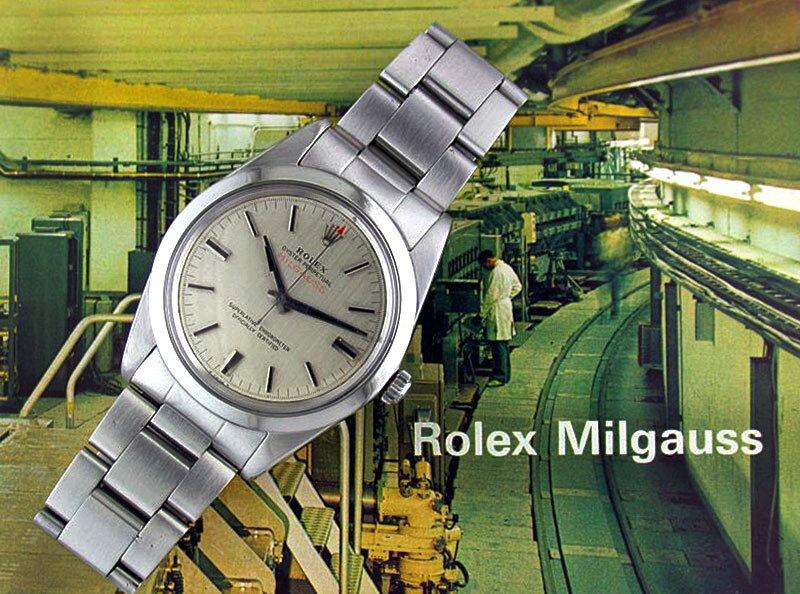 For the past three decades I have been absolutely fascinated–if not obsessed–with the timeless beauty of Rolex watches, and of course I always wondered what the factories that made Rolex watches were like, and I also wondered what the people were like who worked in the factories as well as the executive management. I wondered if I ever had the opportunity to explore the Rolex manufactory, would it be anticlimactic, and end up being like the Wizard Of OZ? 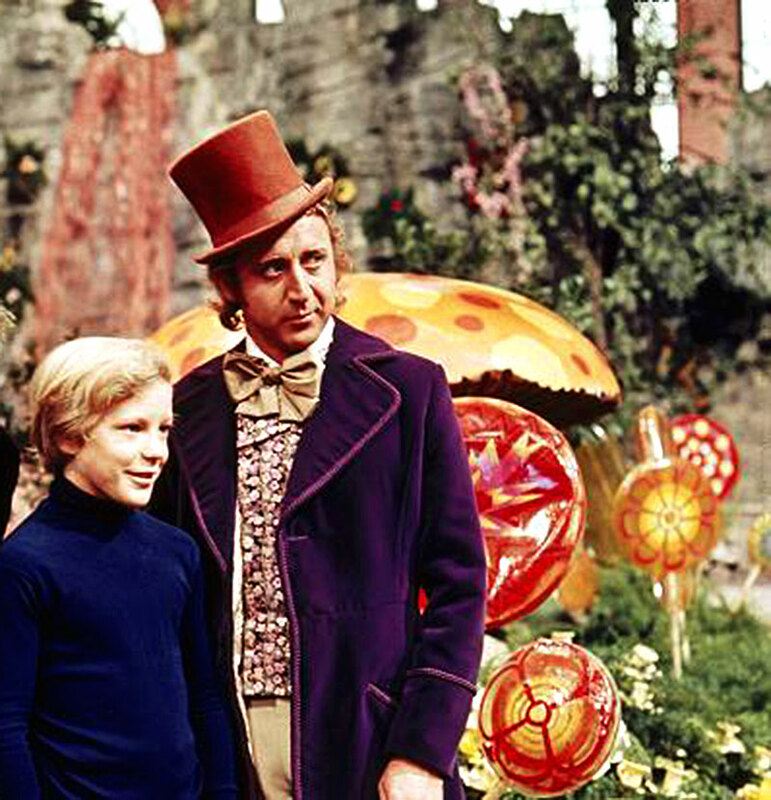 or would it be more like Charlie In The Chocolate Factory? I finally received my golden ticket and saw firsthand how Rolex watches are made with my own eyes in Switzerland! This is a genuinely beautiful story that is deeply inspirational, spiritually uplifting and heartwarming. I never imagined the Cloistered Oyster would ever open up to the world, let alone to me personally, but it did, to reveal a world steeped in old-world elegance and extreme professionalism, coupled with a heavy-duty industrial prowess. Rolex is a company with an amazing heritage that is second to none, coupled with a deep respect for the past, that not only preserves tradition, but creates new history with all the opportunity for a magnificent future. Exploring The Wonderful World of Rolex ended up being a profoundly Otherworldly experience. I have tried as best I am able to share this world, with you in this following story. Rolex is known the world over for its trademark Rolex Oyster watch case which was the first waterproof case to come to market in 1926. I would say that the term Rolex Oyster is a perfect metaphor to describe the Rolex Corporation of today, in the sense that Rolex as a company is also like a watertight Oyster in many ways. As a result of my in-depth Rolex tour, I am able to offer an unparalleled look inside Rolex to see what makes Rolex actually tick. Rolex has historically been extremely protective, secretive, cloistered and discreet when it comes to sharing insight about how it works with the outside world. From what I understand there are very, very few people in history who have been invited to tour all four Rolex facilities, and I was selected as of one of four internet writers chosen for this amazing unprecedented inaugural opportunity. Exploring this hallowed ground was not only a privilege but also an absolute pleasure!!! I spent two and a half days in Switzerland with James Dowling of Timezone, Benjamin Clymer from Hodinkee, and Ariel Adams of A Blog To Watch, taking a most comprehensive tour of all four Rolex manufacturing facilities from A to Zed. The four of us are pictured above during our Rolex tour, at the Rolex World Headquarters in Geneva, and we all loved every moment and had nothing but fun together! It is interesting to note that Benjamin, and Ariel and I have a lot in common, in the sense the three of us all started our online magazine/blogs around the same time in 2008. Also, when Benjamin and Ariel and I began our respective online horological magazine/blogs, we had no idea if they would even be around a year or two later, and we were all simply driven by our passion for sharing stories about watches. For a long time, the horological world looked at "Bloggers", as Alien outsiders, but obviously that has changed over the years, as the internet has become more prevalent. James Dowling is the co-author of the famous Rolex book named "The Best Of Time: Rolex Wristwatches", which is considered to be a seminal Rolex history books. The Best Of Time was a source of inspiration for me. James is known as "Mr. Rolex." and he was one of the founders of Timezone.com, which is more of an online forum. The four of us basically spent the whole time drooling all over ourselves, and drooling all over each other. I kept pinching myself, because I could not believe what I was seeing. I was 100% engaged, 100% of the time, and the best way for me to describe it would be to say it was a completely pure adrenaline rush–from beginning to end. Before I go into more detail, I must profoundly thank all the kind folks at Rolex, not only for their extremely gracious hospitality, but most importantly for trusting us enough to share their sacred world with us. Every person I met at Rolex, from the watchmakers, to the executives, to all the people working in the magnificent Rolex factories were extremely nice, genuine, warm-hearted and treated us like family. I don't recall ever exchanging so many smiles, with so many people, in such a short period of time, in my life :-) It was genuinely awesome, fun and heartwarming to say the least. 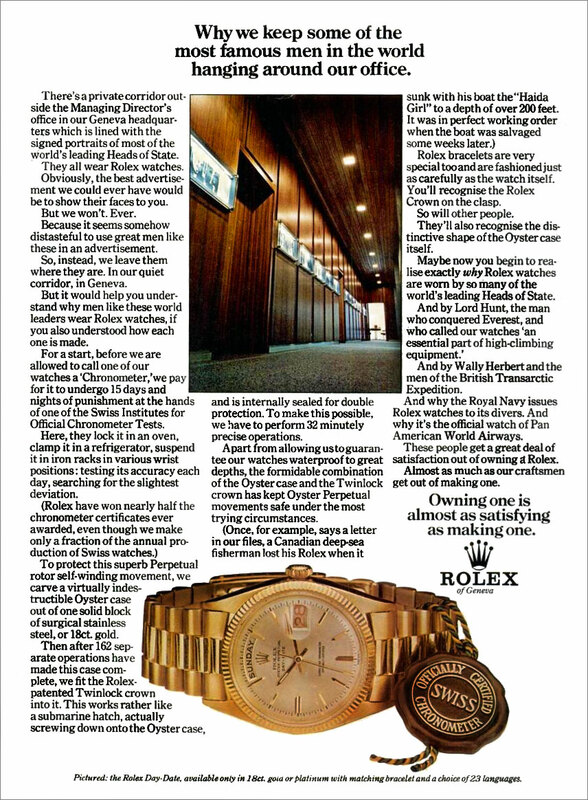 Throughout my experience at, "The Crown", I got the feeling the torch had been passed to a new generation at Rolex. A generation that grew up in a world with different assumptions than their predecessors, and their understanding and open-mindedness created a previously improbable opportunity for us. It is great to finally see Rolex moving full-speed ahead into the digital future. It is my fervent prayer to see Rolex continue to innovate in the digital world, the same way they have historically achieved so greatly in the pre-digital world. 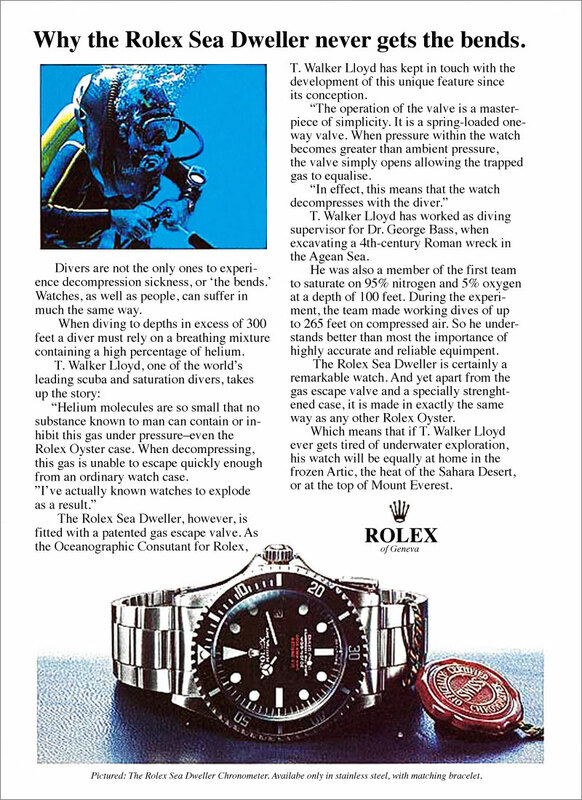 The real beauty and splendor of the digital world opportunity lies in its ability to intelligently organize, share and showcase static detail in a long-term, timeless, persistent way, and as you will see in this article, Rolex has so much stunningly incredible historical content to share. So to the all the amazing people I met at Rolex, Thank You Very Much for your spirit of openness, trust and sharing your spectacular world with me, so that I may finally write and share this profound story of Rolex achievement!!! As many of my readers know, I have often said that Rolex is The International Mark Of Success, and being able to see how the magic is made with my own eyes, represents the opportunity of a lifetime, so once again. Thank you very much!!! My trademark as a Rolex historian, is I don't just show you a bunch of photos with text. Instead, I always seek to take you on a journey through history with the objective of sharing as much meaningful context with you, so you feel like you have experienced the history first-hand. A really good example of this, is the story I wrote about Tenzing Norgay and Sir Edmund Hillary's conquest of Mount Everest. In my Mount Everest story, instead of showing you photos with text, I first took you back to 1953 to take a look around, then I took you to the Tibetan plateau to see how people lived there; then I took you up Mount Everest with Hillary & Norgay; then we continued back to the real world to see the emotional response the world had. In doing so, when you are done reading, I want you to feel like you experienced the history yourself. Of course, with this story, I am attempting the same thing, so fasten your seatbelt, and let's travel together on this wonderful journey into the heart of Rolex watchmaking. I flew out of San Francisco on my journey to visit Rolex World Headquarters in Geneva, Switzerland. 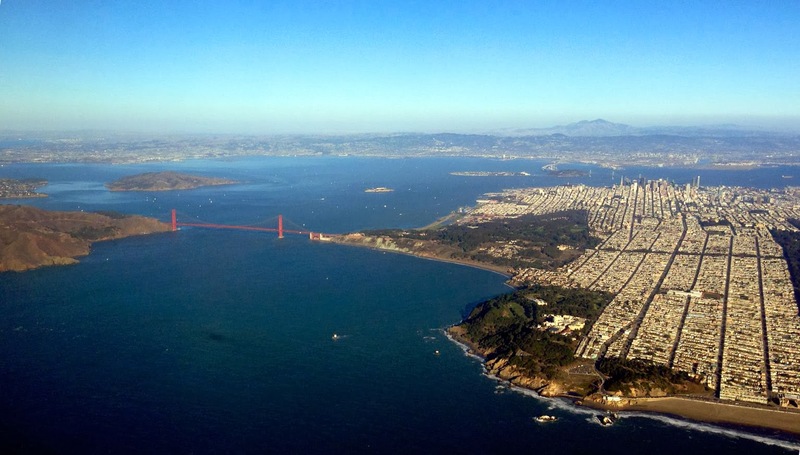 I took the photo of San Francisco seen below as the jumbo 747 began its sweeping 180 degree sharp right turn after it took-off from San Francisco International Airport to head eastward–into the mystic. Rolex is a privately held company, and nobody knows for certain how many watches they make a year, but it is estimated to be somewhere around 850,000, and just to put things in perspective, that would be more watches than the entire number of people who live in my howe town of San Francisco. Think about that for a second!?! Imagine if everybody single person who lives in San Francisco was wearing a Rolex–that is the number of watches Rolex makes annually...Pretty profound if you think about it!!! 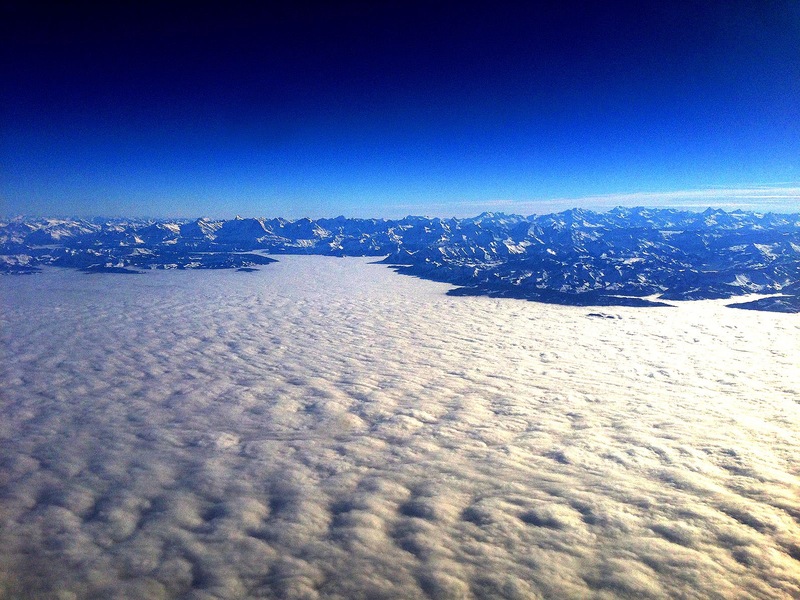 After traveling half-way around the world, we descended into Swiss air-space, headed toward Geneva, and I took this next photo of the magnificent snow-capped Swiss Alps, which were stunningly gorgeous and have protected the Swiss people from invasion for many centuries. I took the photo below of my MacBook Pro screen from my hotel room, and we see Lake Geneva in the background. In the foreground we see Jake's Rolex World on my screen, and I remember when I took this photo, thinking to myself, how profound it was that I was actually about to experience the truest meaning of Jake's Rolex World slogan, which has always been, "Exploring The Wonderful World Of Rolex." My personal experience with the tour was EXTREMELY overwhelming in the most positive sense of the term. I don't ever recall being so intellectually and visually stimulated so much in such a period of time. The entire time I was so deluged with new information, insight and beauty, I was not able to spend any time processing, or even really mentally downloading. In what little time I had after the dinners, and in the early morning, I would just kind of trip on how beautiful Geneva was, and I kept thinking to myself, "I can't believe I finally made it to see Geneva, Switzerland with my own eyes." In many ways, visiting Geneva was like San Francisco in a sense that often times you feel like you are stepping into a beautiful post card. 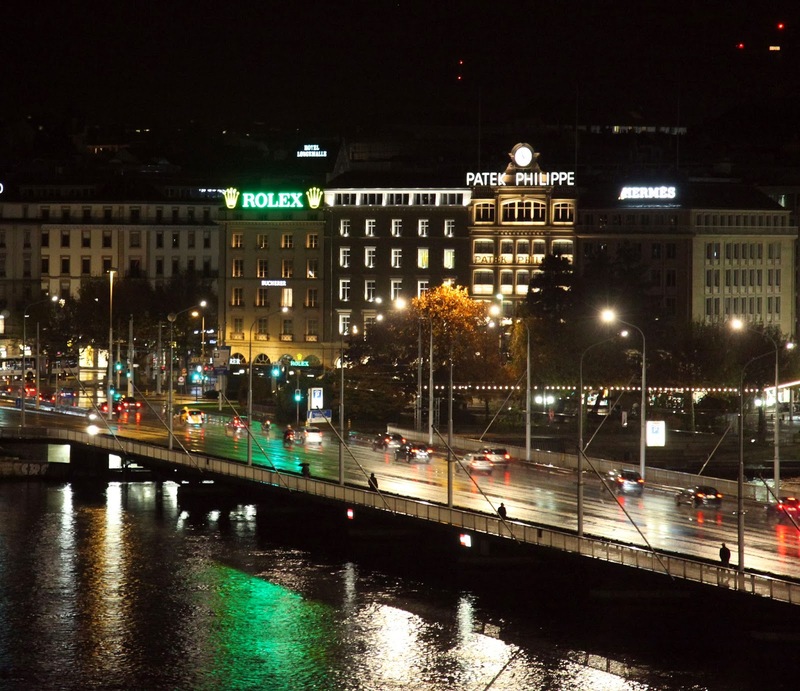 The 1948 Rolex Geneva magazine ad below came to life from my hotel room, as seen in the photo I took that appears below the vintage Rolex magazine ad. Notice the photo I took below from my hotel room shows the famous historical CGN Swiss Vevey paddle steamer ship, which went into service in 1907 on Lake Geneva, and it is pictured above in the Rolex Ad from 66 years ago in 1948. I took the panoramic photo below of Lake Geneva from the balcony of my hotel room at the Hotel de la Paix, located on the legendary Quai de Mont-Blanc in Geneva. Downtown Geneva is like a wristwatch Disneyland for adults, as it is a literal cornucopia of Swiss watchmaking exuberance. 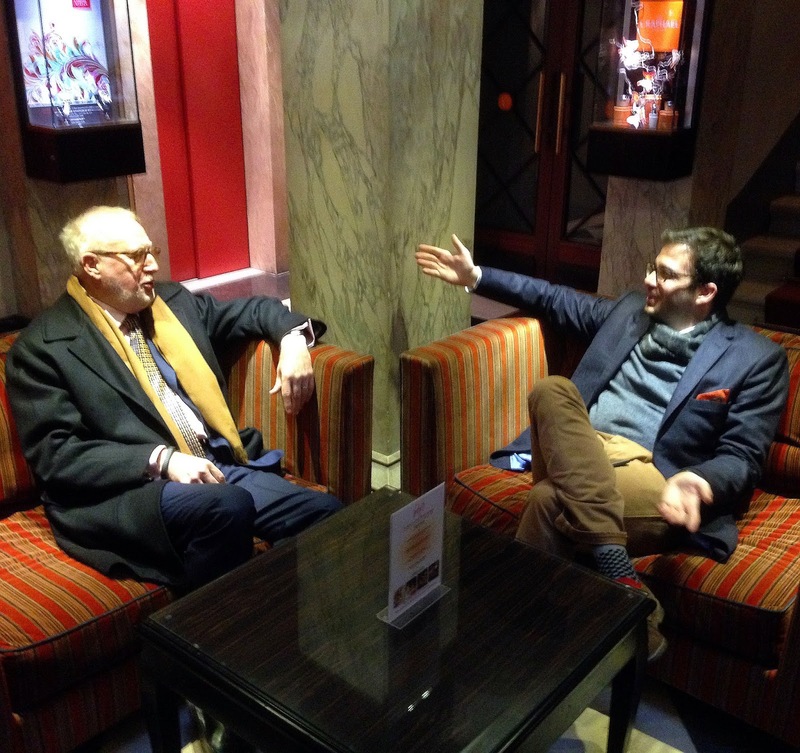 World renowned Rolex expert, James Dowling from Timezone.com is pictured below chatting with Benjamin Klymer from Hodinkee.com in the lobby of the Hotel de la Paix in Geneva, as we prepared to begin our first-day tour of Rolex. As previously mentioned, James Dowling co-authored the seminal Rolex book named "The Best Of Time", and talking with James about Rolex is always amazing! James is a flawless gentleman, and was beautifully tailored in his Saville Row custom suits. Benjamin Klymer is a fascinating, insightful, charismatic, gracious, knowledgeable man, who is very elegant in a New York kind of way. The three of us had arrived a little early and were waiting for Ariel Adams (not pictured) from ABlogToWatch.com. I feel so privileged to have been able to share this incredible experience with these three amazing men. I can only speak for myself, but being able to enjoy this journey with this group, was synergistically superb, since we were able to constantly gleen insight from each other, and witness all the grander of Rolex together. The four of us spent a lot of time smiling, and laughing together in our down-time, and we spent an equal about of time doing heavy-duty WISitus wrapping. I must say despite being completely blown-away by Rolex's world in Switzerland, the thing I enjoyed the most was spending quality-time with all the people, not only in my group of online writers, but also with all the fine people I met who work at Rolex. In the photo below you see me standing in front of Rolex World Headquarters in Geneva. I normally would not have taken such a photo, but Ariel Adams grabbed my camera when I was taking photos of the headquarters building, and insisted on taking the tourist-like photo. If you know me, I am typically kind of shy and don't post pictures of myself on Jake's Rolex World, but I figured since we got to visit what would be the Mecca for Rolex enthusiasts, I might as well share it. 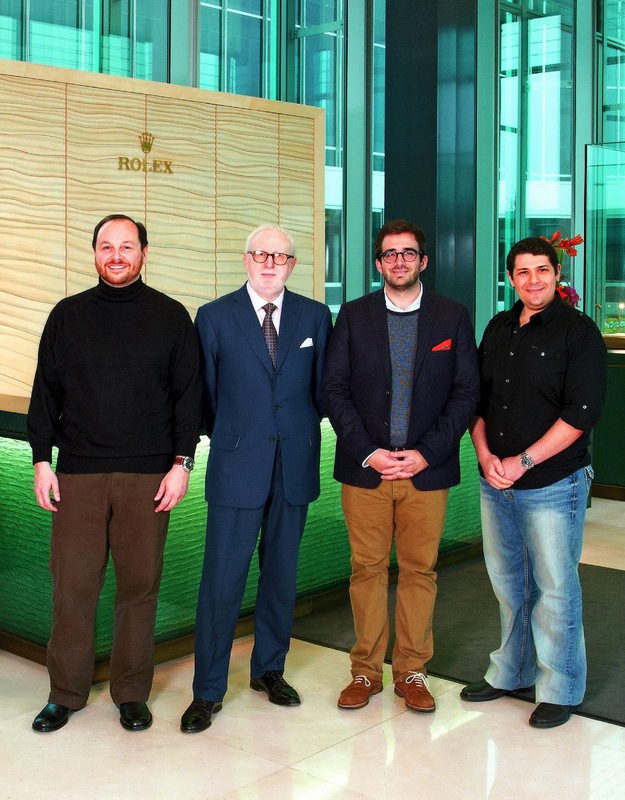 We began our tour on Monday at Rolex Headquarters located in the Acacias district of Geneva, Switzerland. Cantons in Switzerland are the Swiss equivalent of U.S. States. 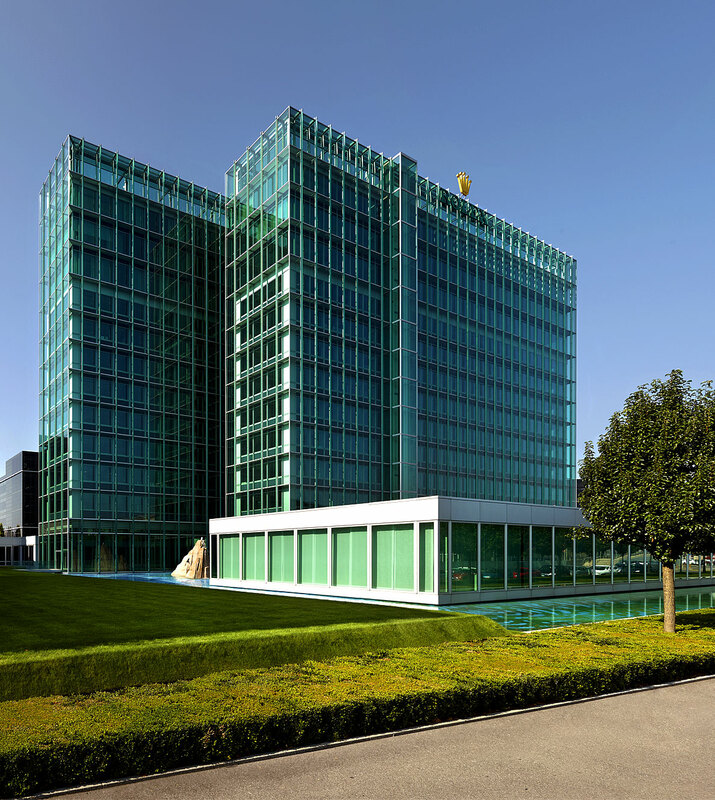 The main Rolex Headquarter building was erected in 1965, and in 2006 was overhauled and they added three floors to the top of the structure. 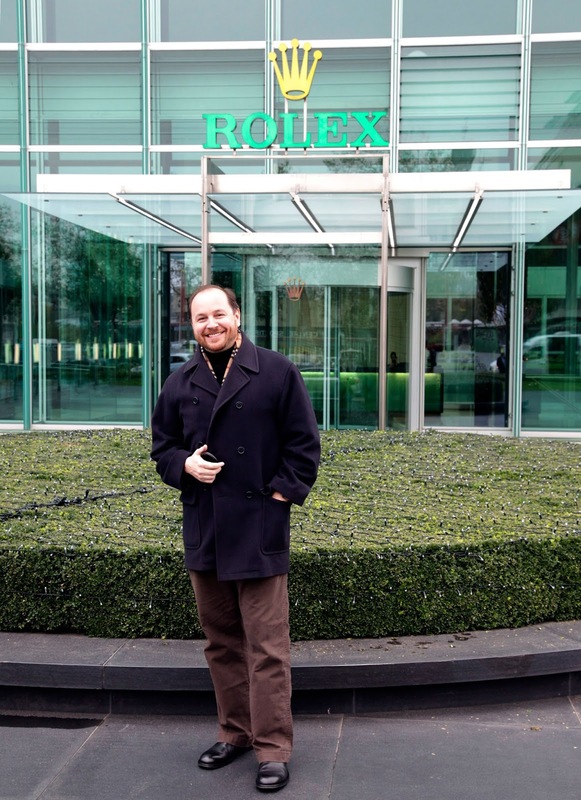 Touring Rolex World Headquarters was incredible! 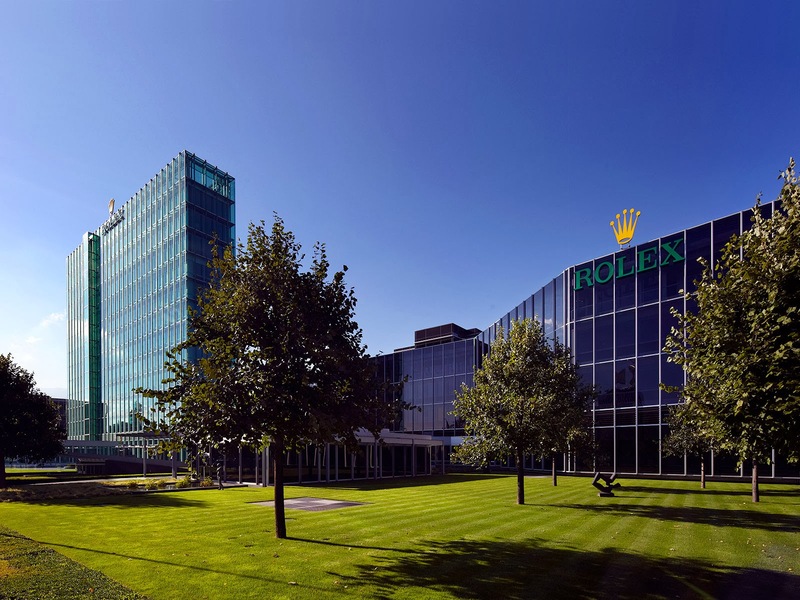 On the inside, Rolex World Headquarters is extremely distinguished, dignified, and regal, and in many ways touring the inside was like being a child who goes to Disneyland for the first time. Disneyland has many different worlds, and each one has its own vibe. For instance, Disneyland has the Matterhorn, Pirates Of the Caribbean, The World Of Tomorrow, The Haunted Mansion, Mickey's House, Tarzan's Treehouse, and each one is unique. Rolex was the same, in the sense that everywhere I turned there was a unique world, completely different from all the other worlds. 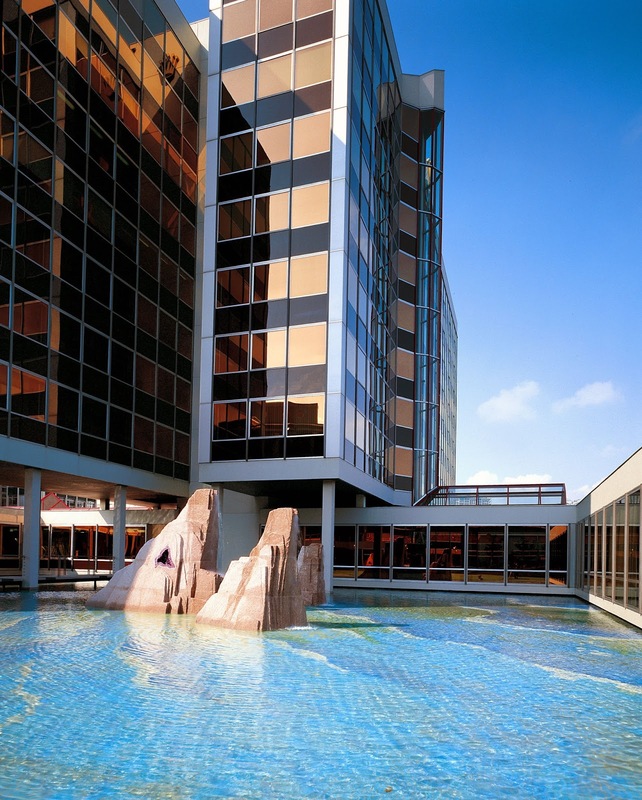 For instance, there was an amazing set of exterior fountains, and the actual Rolex World Headquarters structure is an amazingly beautiful piece of architecture, and just the entrance lobby is stunningly gorgeous. Then there is the Rolex Amphitheater which was completely over-the-top! Even the elevators inside were magnificent. 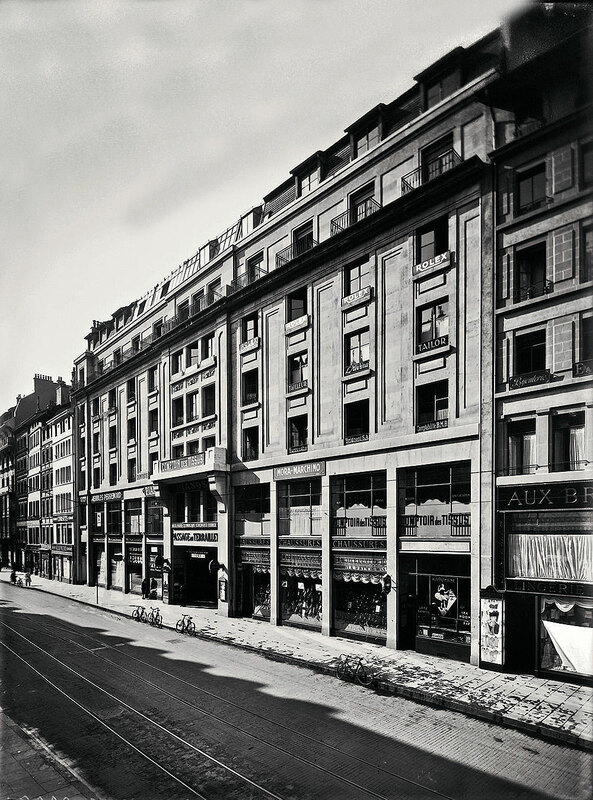 Before I go any further, I want to offer you historical context so you best understand the significance of Rolex Headquarters in Geneva, and how it developed into what it is today. As we begin this journey together, I want to add a little more historical perspective and context, so you can best understand what you are about to witness. Visiting Rolex, in a strange way was like being able to get in a time machine and go back in history. Let me qualify that bold declarative statement, so this all makes sense. Imagine for a moment, you could get in a time machine and go back in time to visit the world of your childhood–but obviously as an adult. You would likely notice all kinds of different things you never noticed as a child growing-up in that same world. Further imagine what it would be like to go back in time and visit the American Revolution, or imagine going back even further to Ancient Egypt, and wandering around. It would be mind-blowing. Since I have invested so much of my life energy in studying and trying to understand Rolex history, often times I get so immersed in it, it seems like I witnessed some of the actual events. Of course, I did not go back in time, but it feels like I did–in a strange kind of way. Having studied Rolex history so carefully, traveling to Geneva and touring Rolex for the first time felt like I actually got in a time machine, but instead of traveling back in time, it instead felt like I had the opportunity to travel forward in time, from Rolex's past to its present. I am going to do something unusual, by sharing my conclusion with you at the beginning of this story. I believe in doing so, it will give you an even deeper appreciation for what Rolex has become today. I am taking this approach because I believe the past is prologue. If you are not familiar with the founder of Rolex, Hans Wilsdorf, I invite you to enjoy my story on Hans Wilsdorf, which is part of my series on The Complete History Of Rolex Leadership. Ironically, the subtitle in my story named The Hans Wilsdorf Story, is "Ghost In The Machine." In a nutshell, Hans Wilsdorf put in place, at Rolex, a culture of absolute excellence, dignity, sobriety and reliability. My conclusion, is I am completely stunned to report that my greatest takeaway point from my detailed tour of all four Rolex facilities in Switzerland, is that Hans Wilsdorf, despite that fact he passed away in 1960, is still very much alive and well today, and seems to still be running Rolex. How is it possible, Rolex's founder, Hans Wilsdorf is still running Rolex today, despite the fact he died 54 years ago in 1960? Hans Wilsdorf was a brilliant man, who spent his whole life pushing the envelope of genuine innovation. To be specific, he completely changed and reinvented the world of horology many, many, many times. As we will soon learn, Hans Wilsdorf founded the Rolex brand in 1905 and spent the next 55 years of his life as a trailblazing pioneer who created the worlds first real WEARABLE TECHNOLOGY, with the advent of Rolex wristwatches at the dawn of the 20th Century. in 1926 he brought the worlds first real waterproof watch to market, named The Rolex Oyster, which is seen in the photo below. Today we completely take waterproof watches for granted, but in 1926, when Rolex brought this advanced technology to life, it was a complete game-changer. 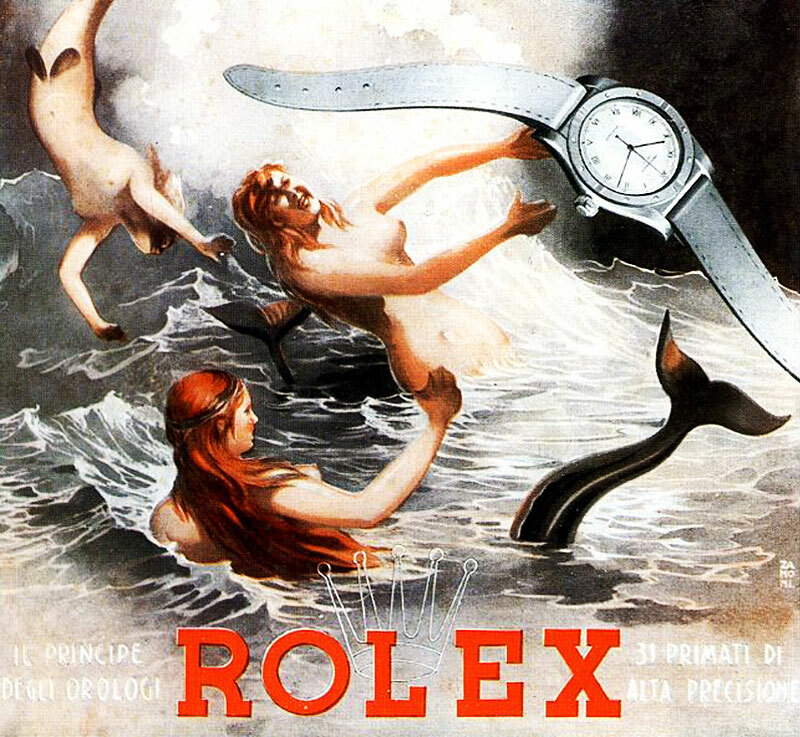 Rolex was extremely proud of their achievement with the Rolex Oyster, and took every chance to celebrate this amazing achievement, including in this 1926 Italian Rolex Poster. Rolex again revolutionized the world of horology in 1931, when Rolex brought the worlds first commercially viable automatic movement to life with the advent of the Rolex Perpetual self-winding movement as seen below. In case (no pun intended :-) you are not familiar with the term "automatic movement", it means the watch movement (hidden inside the watch case) has an internal rotor that perpetually winds the watch from the energy of your wrist movement. This also may not seem like such a big deal today, but in 1931 it was an immense inflection point and milestone achievement. What exactly is a SMART Watch, and who invented it? In my opinion, Rolex invented and significantly evolved the SMART Watch. This began in 1926, when Rolex brought to market the smartest feature in horology, which was the advent of the water-proof watch with the innovation of the Rolex Oyster. The next super-smart innovation from Rolex labs, came several short years later in 1931 with the advent of the Perpetual movement, which was the first to automagically wind a users watch from the natural movement of the wearers wrist. In 1947, Rolex introduced the The Rolex Oyster Centegraph (pictured above) and the Rolex Oyster Zerograph (pictured below), which were were the first watches I am aware of that featured a spinning bezel that could be used to time events. These interesting models featured a single button chronograph for measuring time, and the Rolex Zerograph, pictured below features the now classic art-deco Rolex "California Dial", which Rolex patented at the time. The Rolex "California Dial" features the some of the timeless art-deco details that eventually made it onto the Rolex Submariner and GMT dials, more than fifteen years later, which include the upside-down pyramid marker at 12, as well as the three rectangle markers at 3, 6, and 9. This art-deco masterpiece also features the "Mercedes" marker on the hour hand, which would also make its way into all the Rolex professional tool watches in the decades to come.. In 1945 Rolex introduced an all-new model that would confirm their trajectory toward genuine greatness, with the introduction of the Rolex Datejust. Hans Wilsdorf and Rolex gave then NATO Supreme Commander and World War II hero, General Dwight D. Eisenhower a Rolex Daejust as a token of their deep appreciation for freeing Europe from Nazi tyranny. 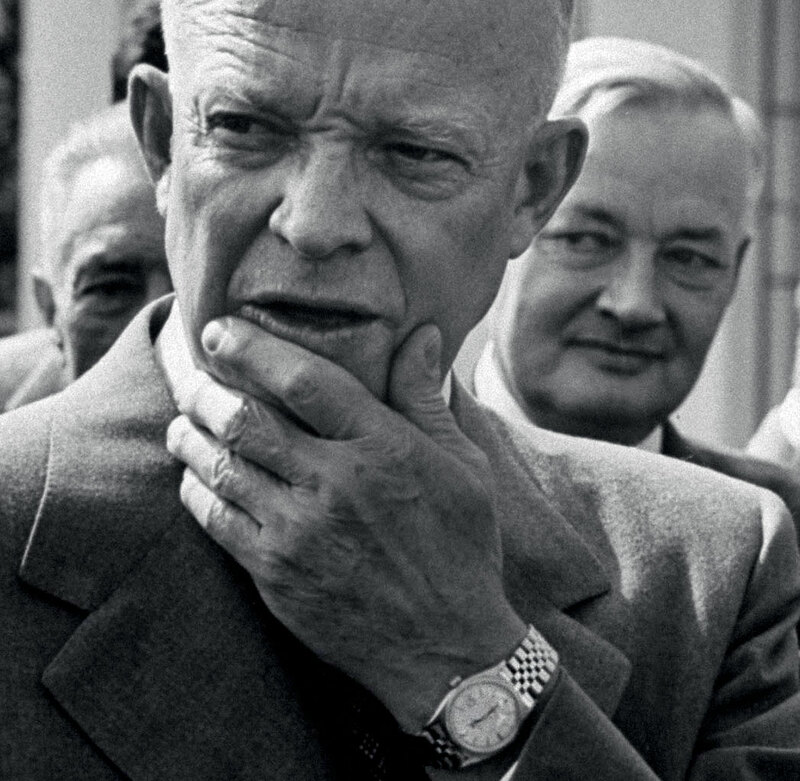 This was no ordinary, Rolex Datejust, it was the 150,000 Officially Certified Swiss Chronometer, and it is pictured below on President Eisenhower's wrist. 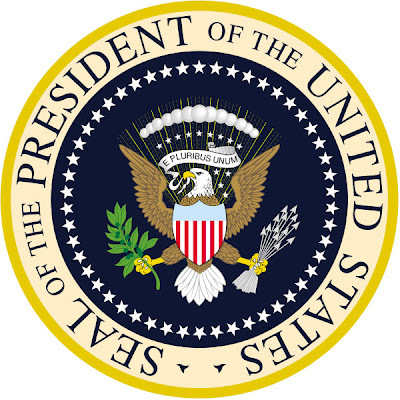 President Eisenhower's Rolex created a legacy of world leaders wearing Rolex watches, and it also created the mythical term of The Rolex President. 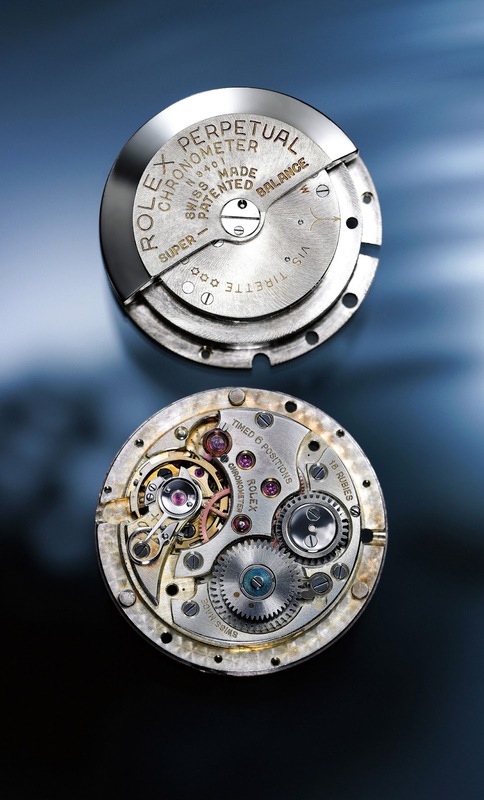 The all-new Rolex Datejust model introduced by Rolex in 1945 is pictured below, and it offered another revolutionary feature which we take for granted today, which is a date aperture window, as seen below. In the photo below we see a 1952 Rolex Super-Oyster, Triple Date Moonphase, with an extremely rare black star dial, and this beauty is in like-new condition. In 1953, Rolex introduced the Rolex Explorer as an homage to Tenzing Norgay, and Sir Edmund Hillary's conquest of Mount Everest. Also, in 1953 Rolex developed, and successfully brought to life, what today is the most iconic watch in history, known as the Rolex Submariner, which is pictured below. The fascinating Rolex magazine ad pictured below is from 1955, and it is the very first Rolex Submariner ad I am aware of. 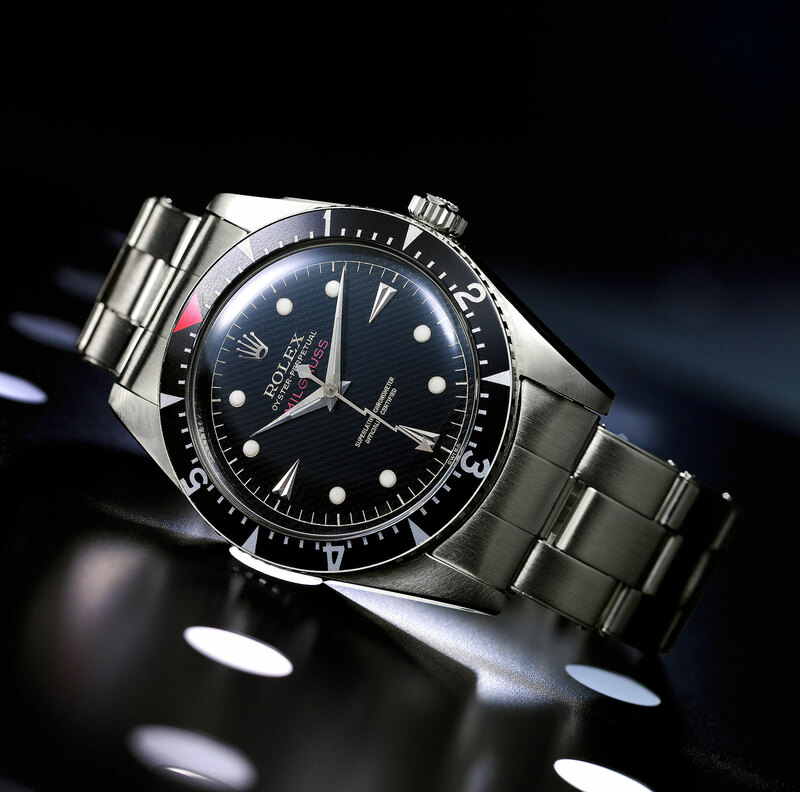 Rolex launched the GMT-MASTER (pictured below) in 1955, and not only was it one of the smartest watches in history, but the most intelligent SMART WATCH. 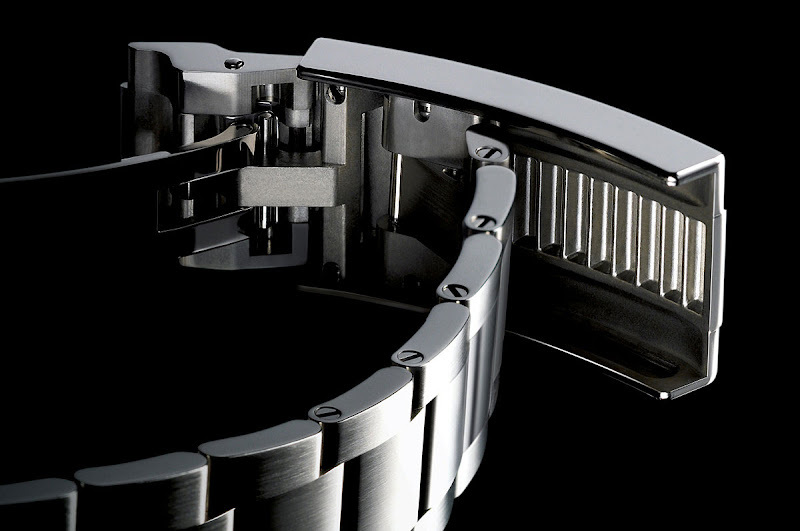 Rolex invented the spinning bezel and was the first watch brand to offer this innovative smart feature. 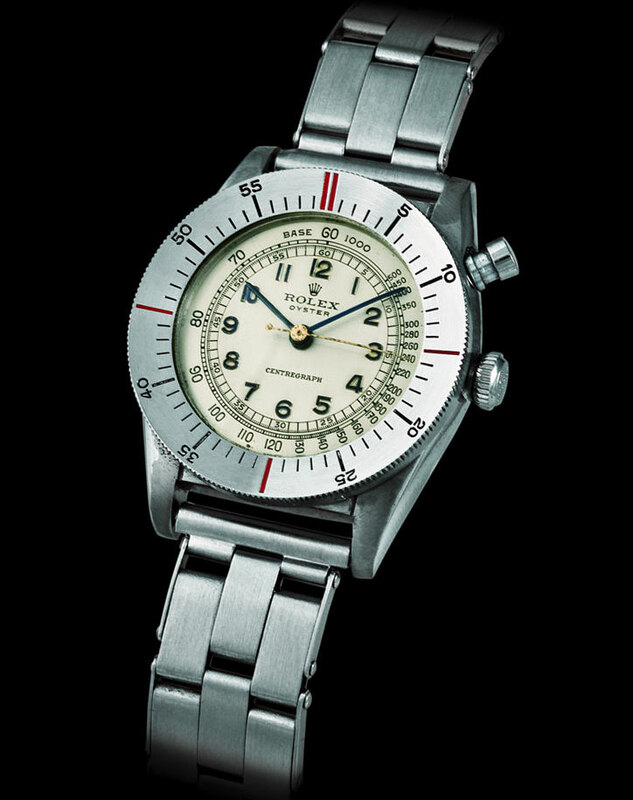 The GMT-MASTER could also keep time is multiple time zones, and looked super-cool. 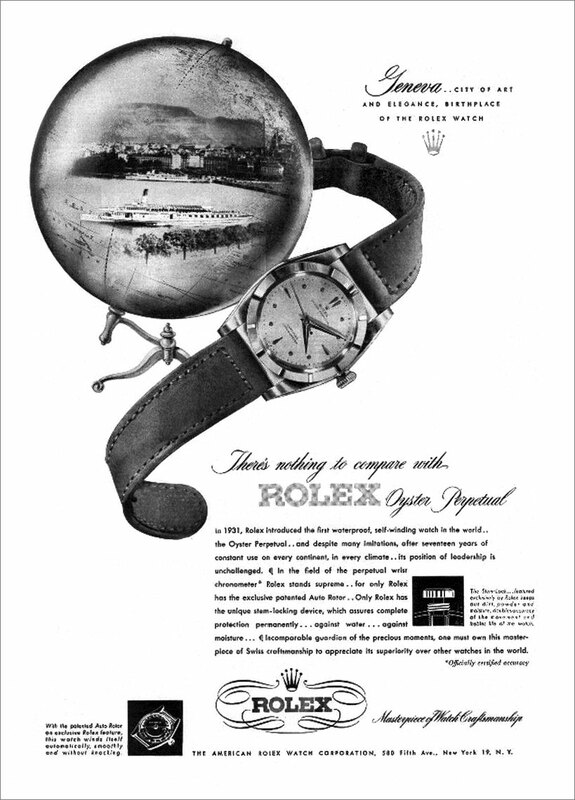 The Rolex GMT-Master advertisement below is from 1955, and really showcases the worlds SMARTEST WATCH. Rolex continued their rapid progress with SMART watch features, including the advent just a year later in 1956, of the Rolex Day-Date which was the first watch to not only offer a DATE aperture window, but a DAY aperture window as well. 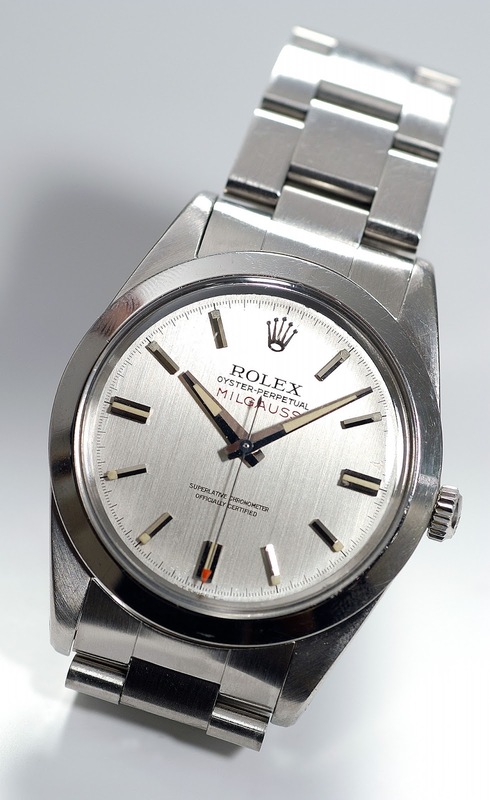 Also in 1956, Rolex introduced another brilliant SMART tool watch known as the Rolex Milgauss, which was an antimagnetic watch specially designed for people who worked in specialized environments like the CERN Research Labs in Geneva, Switzerland. I included the photo below of the 1956 Rolex Milgauus since it shows off the waffle pattern dial, which was popular with Rolex watches in the 1950s. 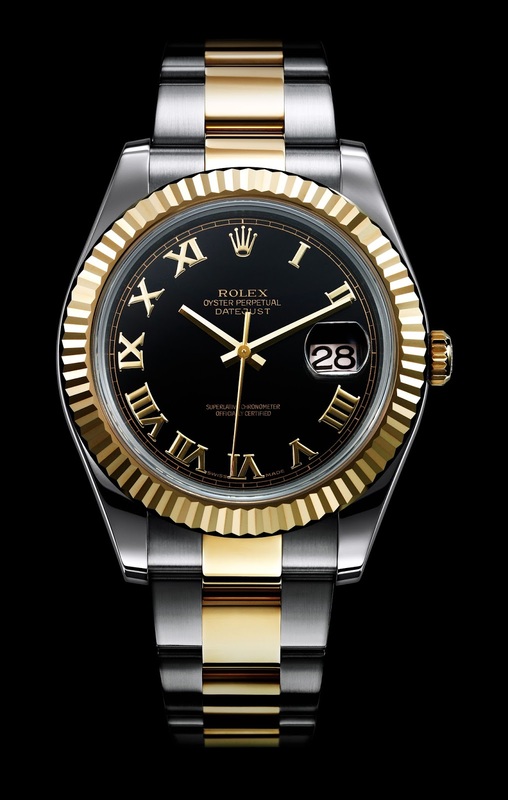 I would love to see Rolex bring back this dial style, as it adds beautiful dimension to the watch. CERN is the European Organization for Nuclear Research, which was founded in 1954. 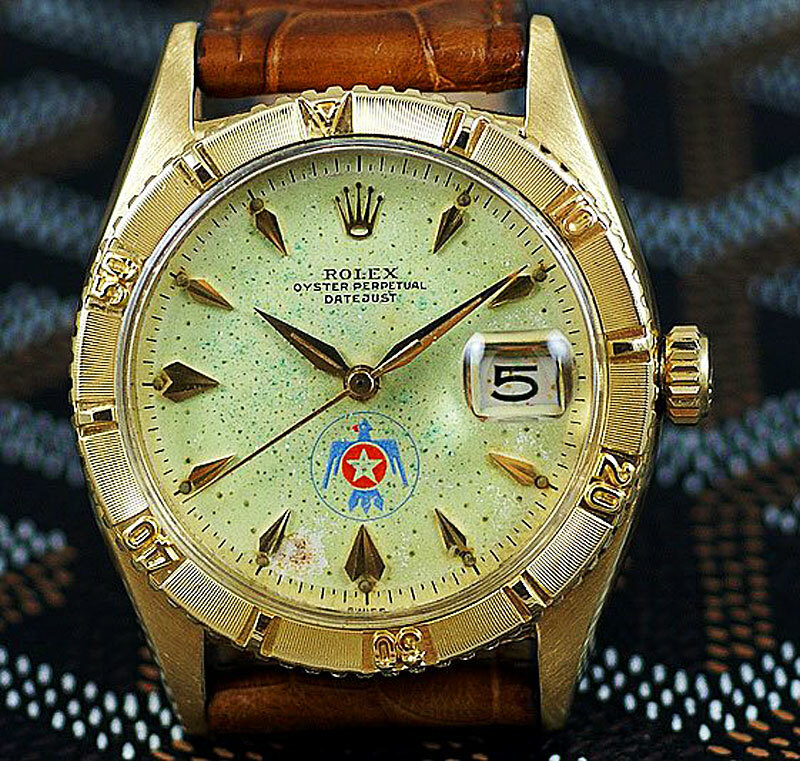 At the time, CERN lab scientists were having challenges with their watches keeping accurate time because of the strong magnetic fields so Rolex figured out how to overcome this challenge with another SMART innovation, known as the Rolex Milgauss model, (pictured below) which had a lightning-bolt second hand, which made it unusual. In 1959, Rolex developed the Rolex Thunderbird for the U.S. Air Force Thunderbirds, which were the official demonstrations team that was activated at Luke Air Force Base in Arizona, with the designation of the 3600th Air Demonstration Unit. This model was based upon a special Datejust, with a spinning bezel feature added for the pilots. 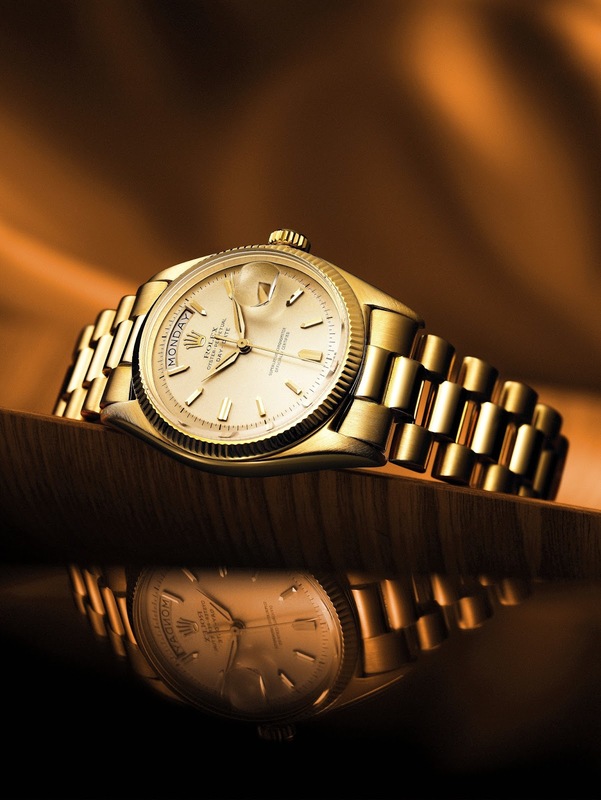 Rolex pioneered the wrist-watch, as well as creating the worlds first SMART watch models. Rolex innovated like crazy throughout Rolex founder, Hans Wilsdorf's life. Hans Wilsforf, and his wife May Wilsdorf did not have children, so Hans Wilsdorf developed The Wilsdorf Trust to take care of his beloved Rolex in the hopes it would continue to perpetuate his dream vision after he was gone. I am happy to report, the Rolex of today, has beautifully lived up to his desire to perpetually continue moving forward. In other words, what I witnessed recently on my tour of all four Rolex facilities is an extremely successful company, absolutely dedicated to continually, and consistently delivering on Hans Wilsdorf's vision. This is one of the most remarkable success stories in the history of business. As an entrepreneur and business man, Hans Wilsdorf flawlessly executed one of the most successful business plans in history, and to see his beautiful Rolex dream machine running even better today, is truly remarkable. 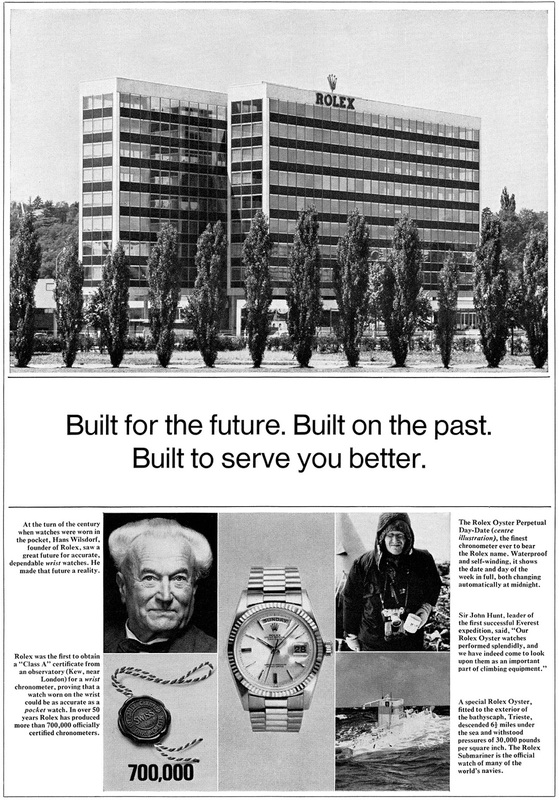 Thus, I am happy to report that Hans Wilsdorf is still very much alive and in control of Rolex today. As I previously mentioned, I highly recommend reading or rereading The Hans Wilsdorf Story. 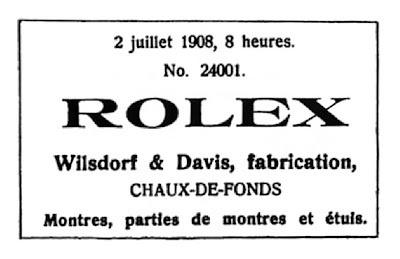 In 1908, Hans Wilsdorf registered the name of Rolex as a trademark for Wilsdorf & Davis Ltd., and the image below is the official registration from July 2nd of 1908. André Heiniger was the second major director of Rolex. It is worth noting that Rene-Paul Jeanneret was the Director of Rolex under Hans Wilsdorf, and Rene-Paul was one of the great innovators at Rolex. 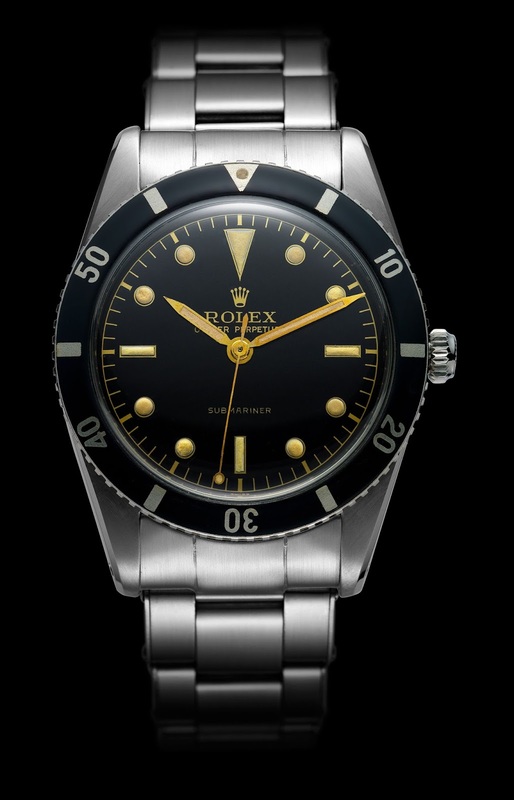 In particular he developed the now iconic Rolex sports tool watches including the Submariner with Jacques-Yves Cousteau, and GMT-Master with Pan American Airlines, as well as the Rolex King Midas. 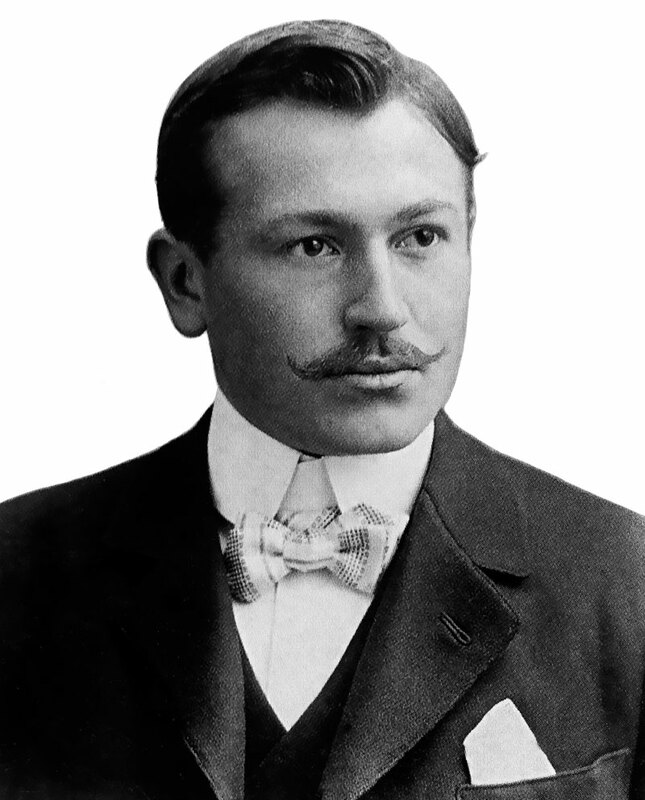 André Heiniger was really the person responsible for modernizing Rolex and turning it into an ultra-succesful international brand. 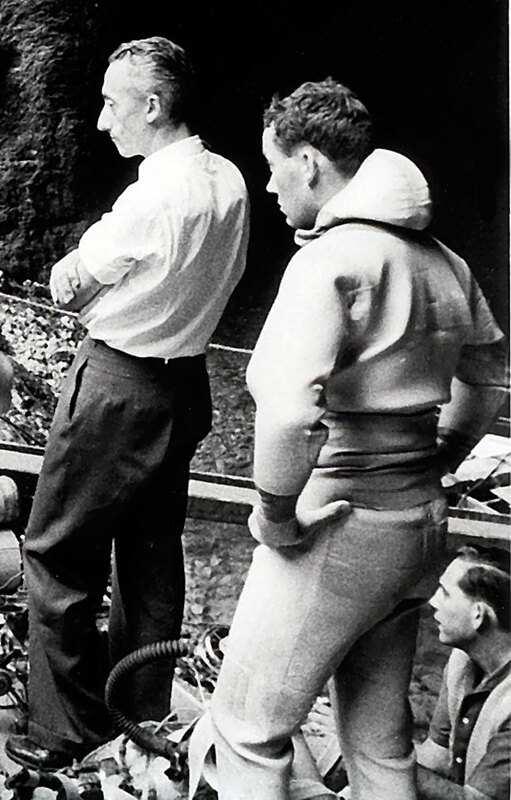 He was born in La Chaux de Fonds in 1921 and went to work for Rolex in 1948. 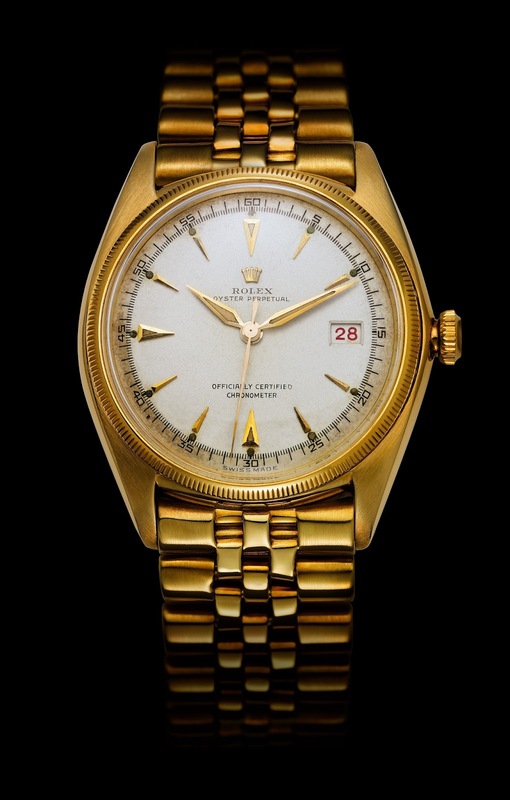 André Heiniger became the Director of Rolex in 1963 when he was 42 years old. You can learn much more about his amazing career by checking out The André Heiniger Story: Second Ghost In The Machine. André Heiniger was fascinated with people who pushed the envelope of what was possible, which covered a wide range of humanity. He was fascinated with high levels of achievement in everything from business, to science, to race car driving to deep-sea diving. 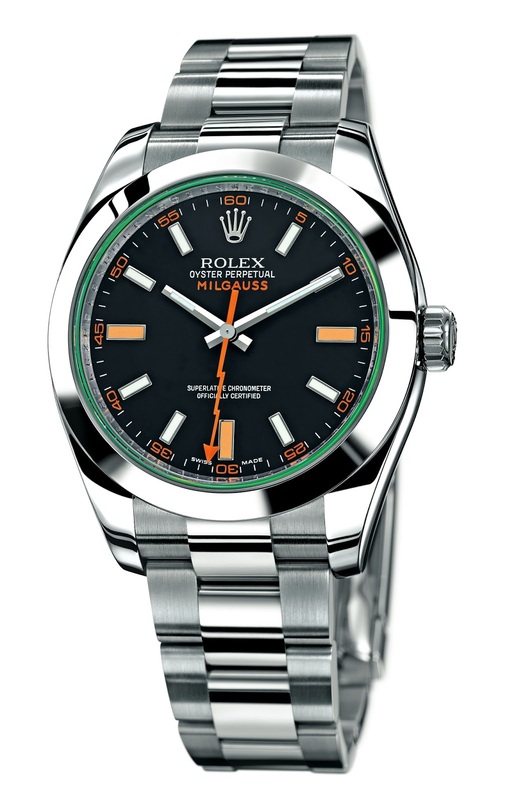 In 1967 Rolex introduced a brand new version of the Rolex Milgauss named and gave it a reference number of 1019. This model was remarkably different looking from its predecessor. In the second half of the 1960s, André Heiniger developed a relationship with the United States Navy SEA-LAB to test an experimental deep sea Rolex Submariner named the Rolex SEA-DWELLER. The photo below shows the U.S. 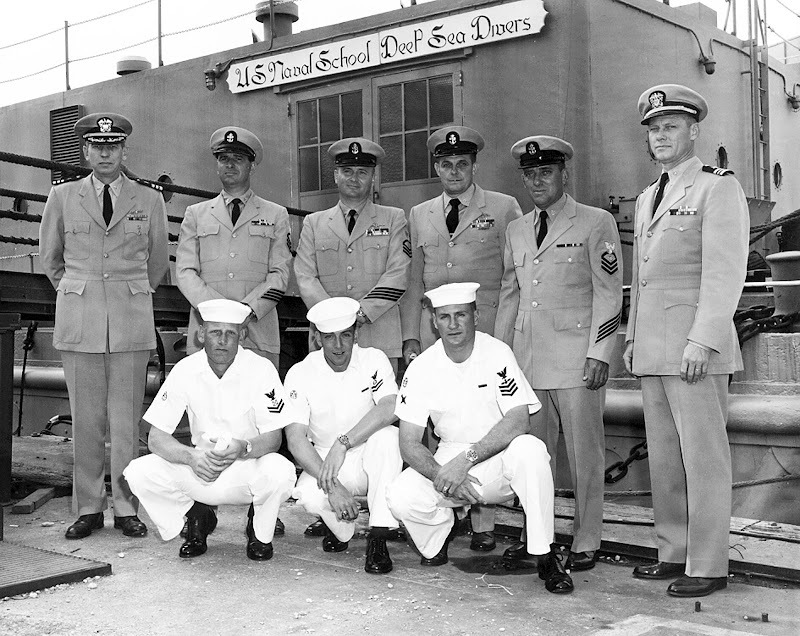 Naval School for DEEP-SEA Divers in Washington D.C., at the EDU (Experimental Diving Unit). 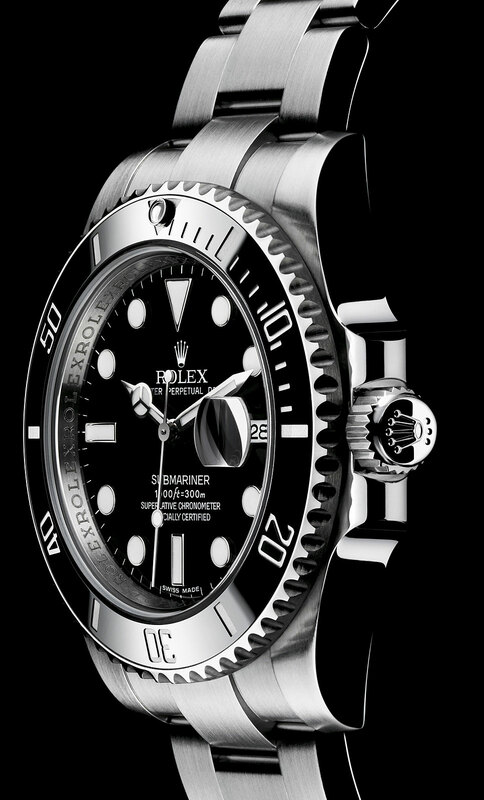 A direct result of this relationship with the U.S. Navy SEA-LAB, was the development of the Rolex SEA-DWELLER (pictured below) which was co-developed with the U.S. Navy SEALAB. 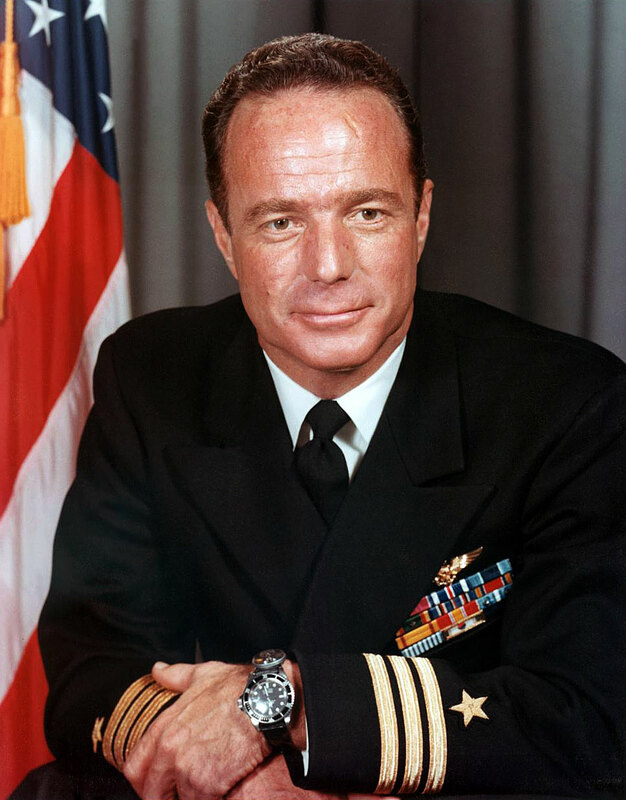 The most famous member of the U.S. Navy SEA-LAB program, was Scott Carpenter, who began his U.S. Navy career as a test pilot, then went on to become one of the first seven U.S. NASA Astronauts. 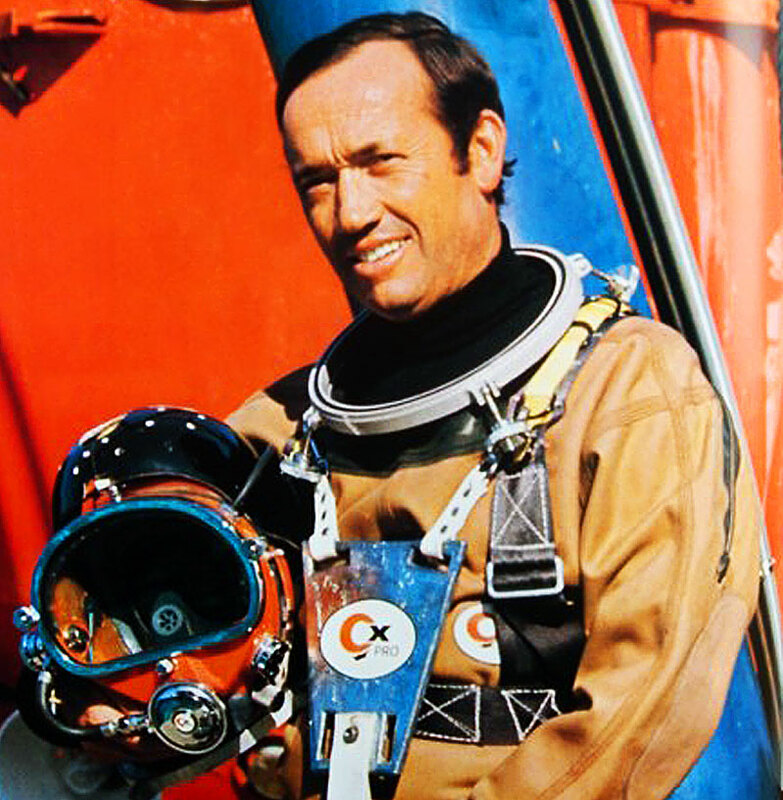 Scott Carpenter, then went on to become a aquanaut in the U.S. Navy SEA-LAB program, and is pictured below in 1965, during SEA-LAB II. and Scott is wearing his Rolex SEA-LAB Submariner. 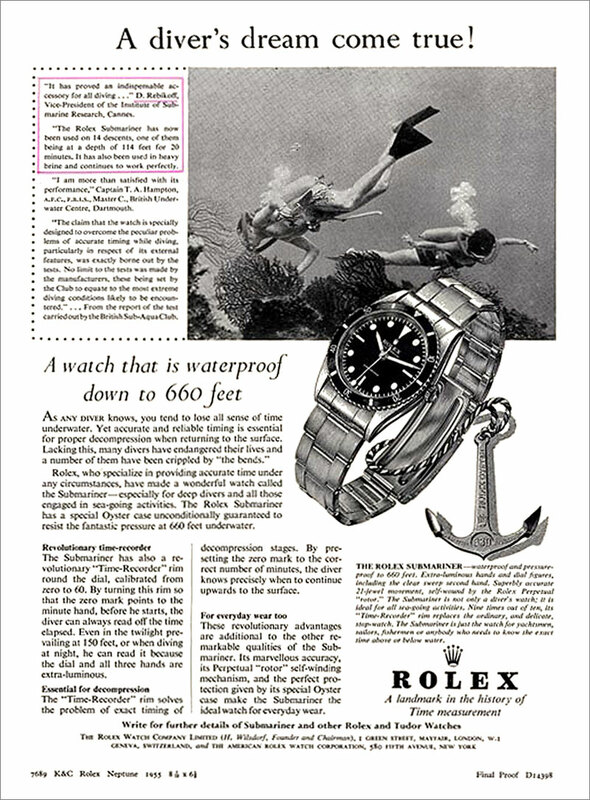 The Rolex Submariner was originally designed for and marketed as a tool watch for men who lived an aquatic lifestyle, as we see in the 1967 Rolex Submariner magazine ad pictured below. 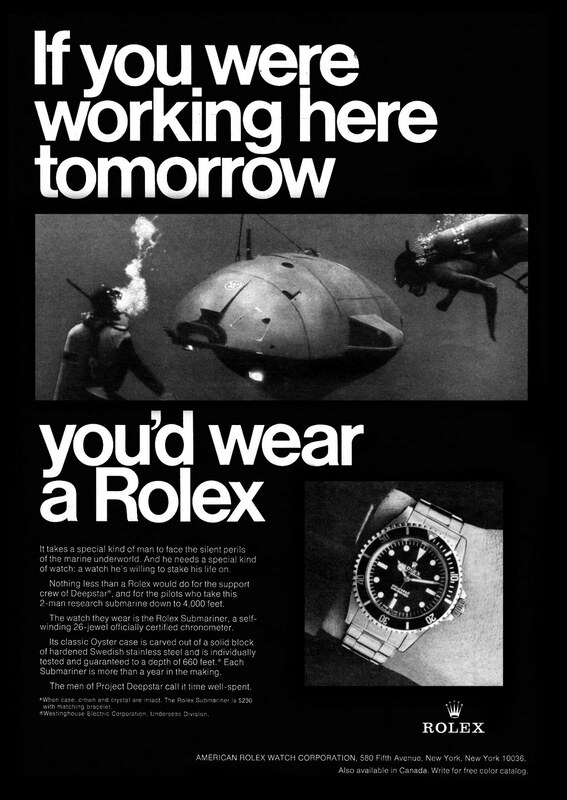 These next Rolex Submariner magazine ads are from 1968. 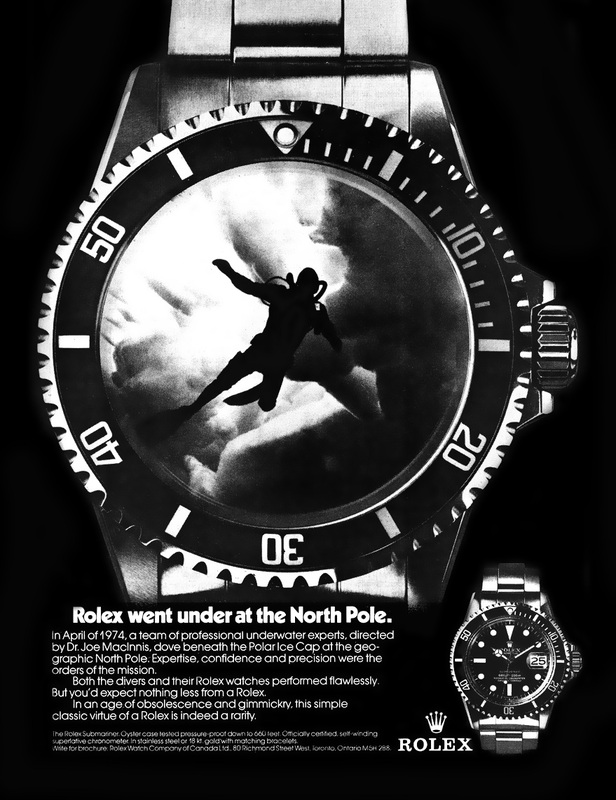 The next magazine ad for a Rolex Double Red SEA-DWELLER, and it is from 1974, and features T. Walker Lloyd, who was one of the most famous Deep-Sea Divers in the world. T. Walker, or "T", as André Heiniger called him personally, was also a Rolex U.S.A. executive, who was deeply involved in developing the Rolex SEA-DWELLER. 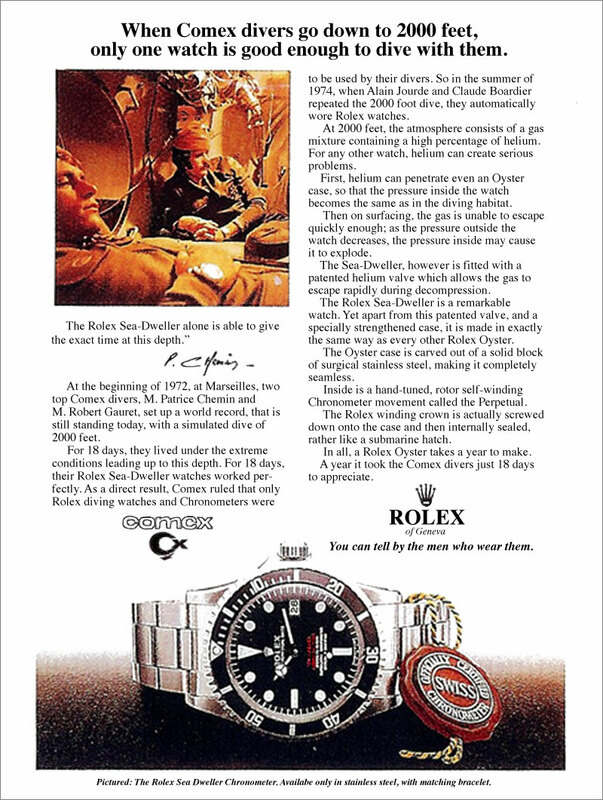 André Heiniger also developed the Rolex relationship with COMEX to expand upon the learning that came from Rolex's collaboration with the U.S. Navy's SEALAB program. 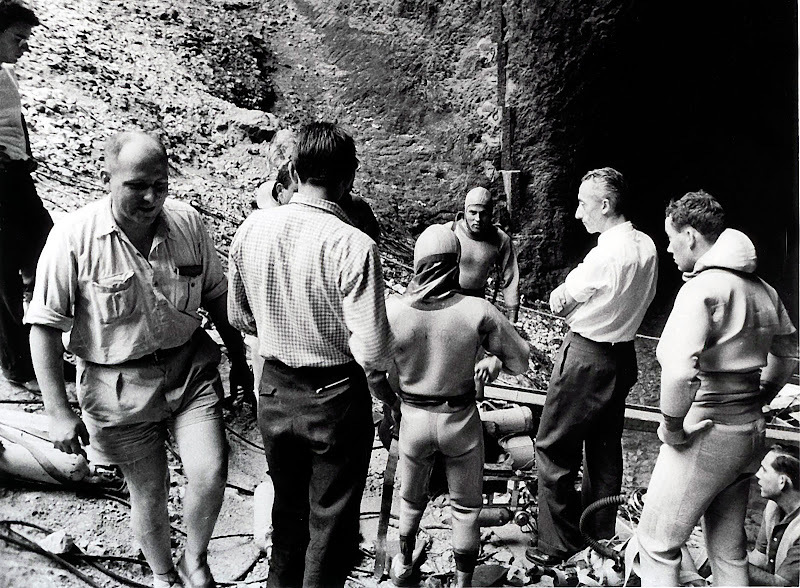 COMEX was founded by legendary French diver, Henri-Germain Delauze, who is pictured below in 1955, standing behind legendary underwater explorer and fellow Frenchman, Jacques-Yves Cousteau, who he worked for a the time. Jaques-Yves Cousteau co-invented the Aqua-lung which brought SCUBA Diving to life and Henri-Germain Delauze ended up being perhaps the greatest beneficiary of this technology. 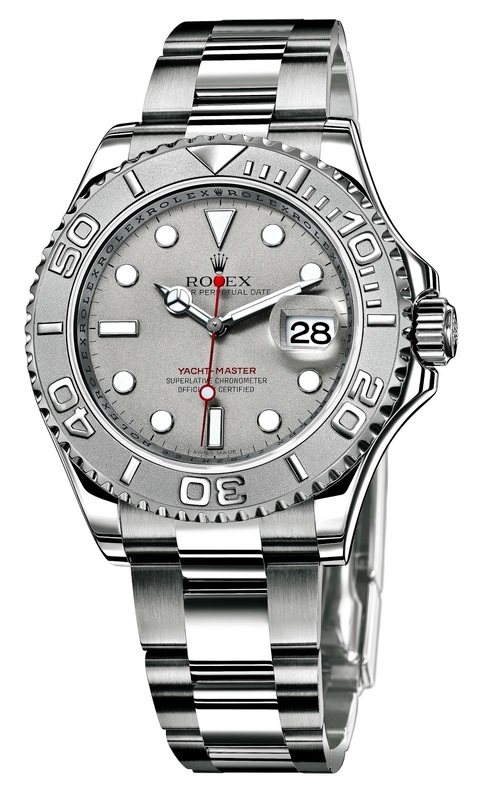 Rolex made special experimental Submariner and SEA-DWELLER models that had the COMEX designation on the dial as seen in the photo below. 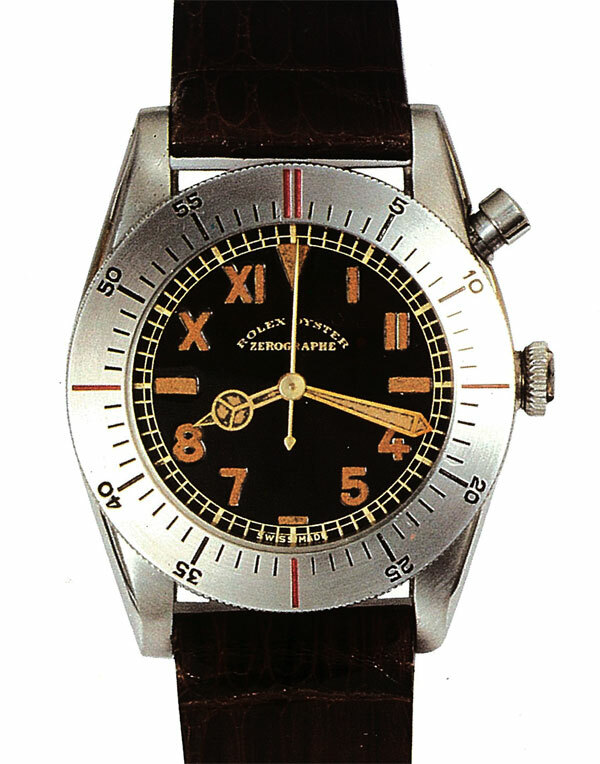 These watches were never made available to the public, and thus today they are very rare and highly collectible. 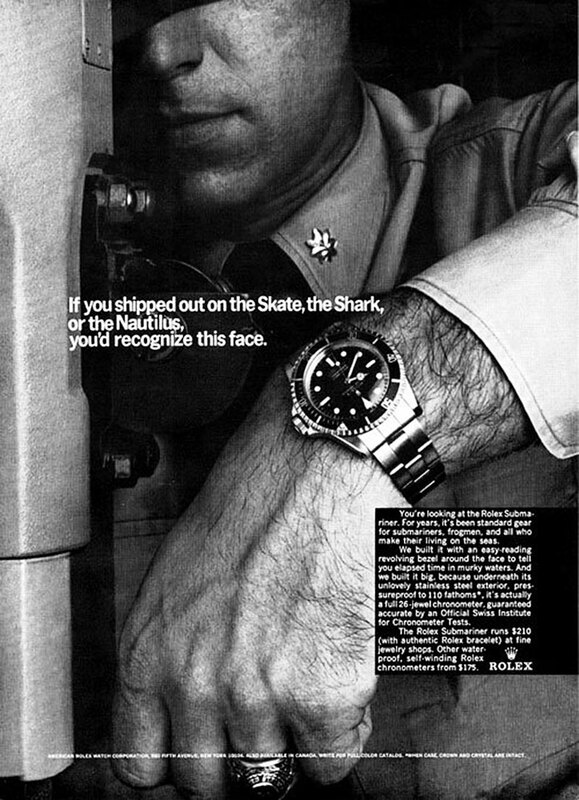 Rolex continued development of the Submariner and SEA-DWELLER through the 1970s, and continued to support research programs that depended upon the Submariner, as seen below in this 1975 Rolex ad featuring Dr. Joe Macinnis. In the early 1960s, André Heiniger was responsible for bringing the Rolex Daytona model to life as he was a big automobile racing enthusiast. 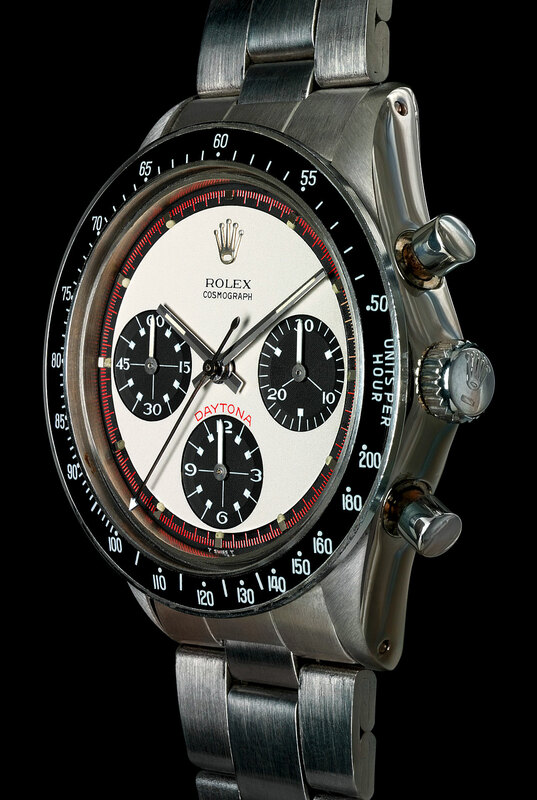 The Exotic White Dial Daytona, as pictured below became very famous due to Paul Nemwan wearing one. André Heiniger oversaw the development of the Rolex Oyster-Quartz models which represented Rolex's foray into making Quartz models. 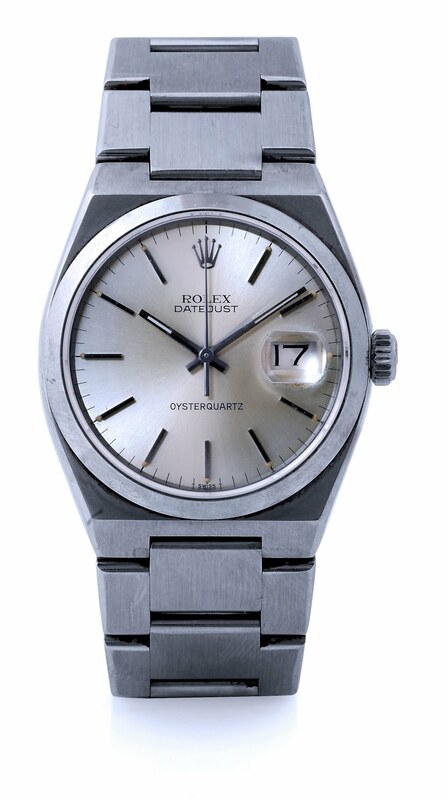 The Rolex OysterQuartz models evolved from and were largely the byproduct of the Beta 21 program, which took place in Switzerland in the later 1960s. 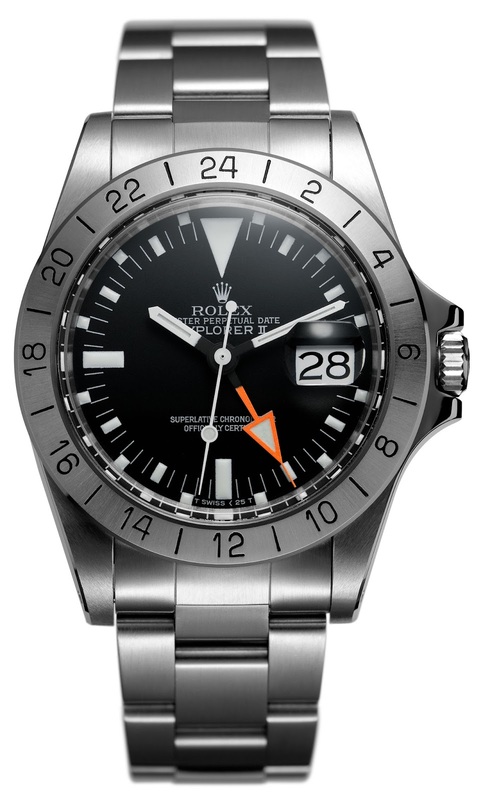 Under André Heiniger's leadership, Rolex introduced the Rolex Explorer II "Orange Hand" in 1971, which kept track of the time in a second timezone. This watch was designed for explorer's who were cave-dwellers, that would spend long periods of time underground. 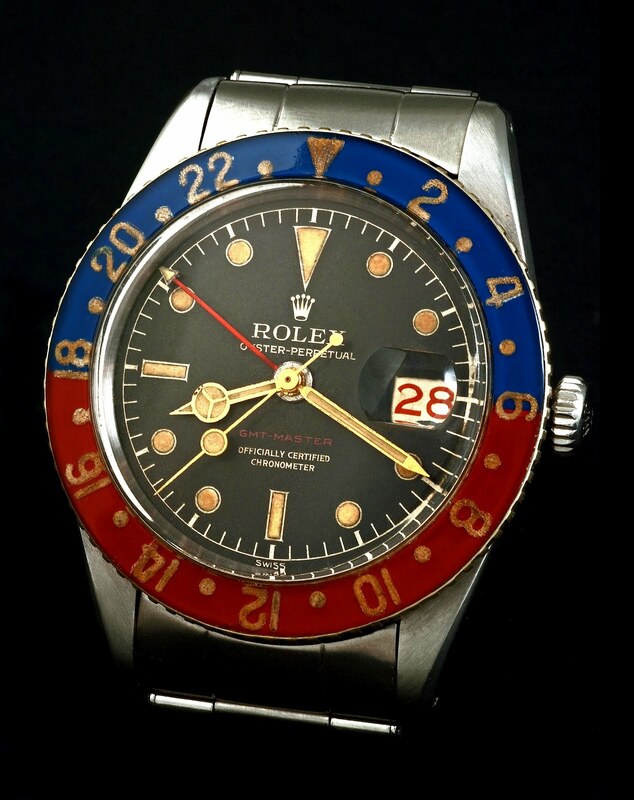 In 1982, under the leaderships of André Heiniger Rolex significantly updated the classic Rolex GMT-Master, and introduced the Rolex GMT-MASTER II, as see below. 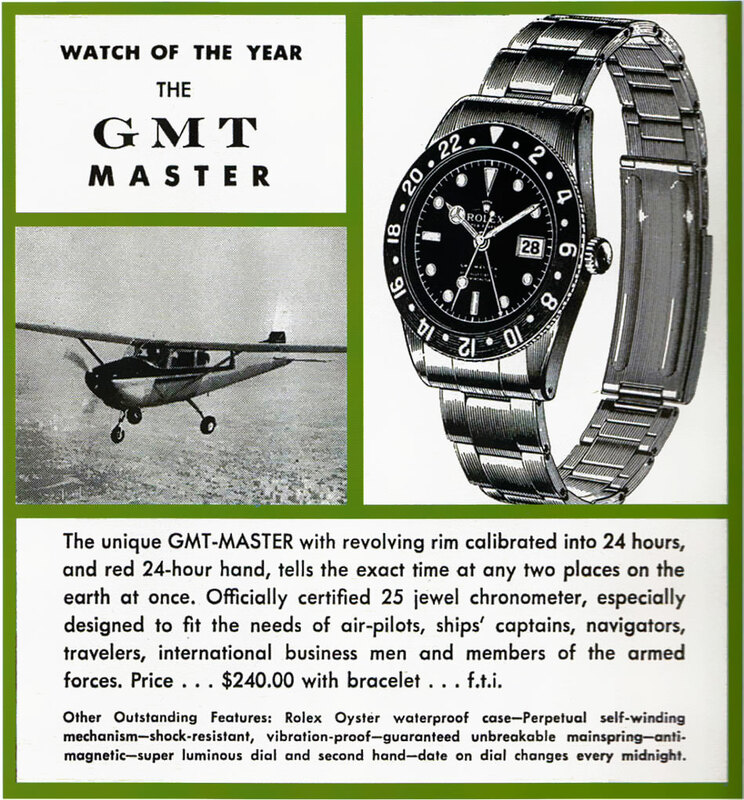 The GMT-Master II was similar in many ways to the GMT-Master II, but it replaced the now classic, plexiglass crystal with a synthetic sapphire crystal, and it also added the "quick-date-change" feature, which allows the user to quickly change the date as a separate action using the winding crown. 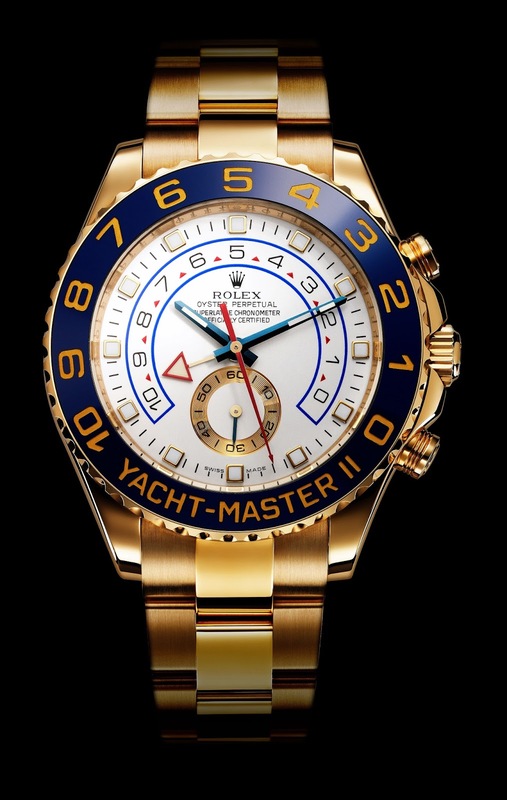 Rolex also introduced the Rolex Yacht-Master in the last year of his tenure in 1992, as seen in the photo below. 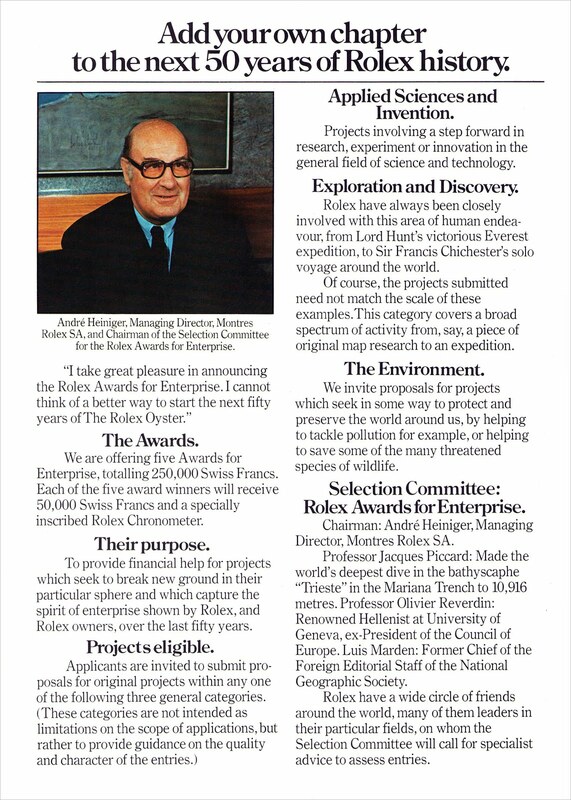 In 1976 André Heiniger founded the Rolex Awards for Enterpise to mark the 50th anniversary of the founding of the waterproof Rolex Oyster watch. André Heiniger was one of the visionaries responsible for building Rolex's all-new state-of-the-art, ultra-modern Genevan headquarters. Just when Hans Wildorf passed away in 1960, Rolex Worldwide Headquarters were getting too cramped for an ever-expanding company, and no longer reflected the image Rolex wished to reflect. 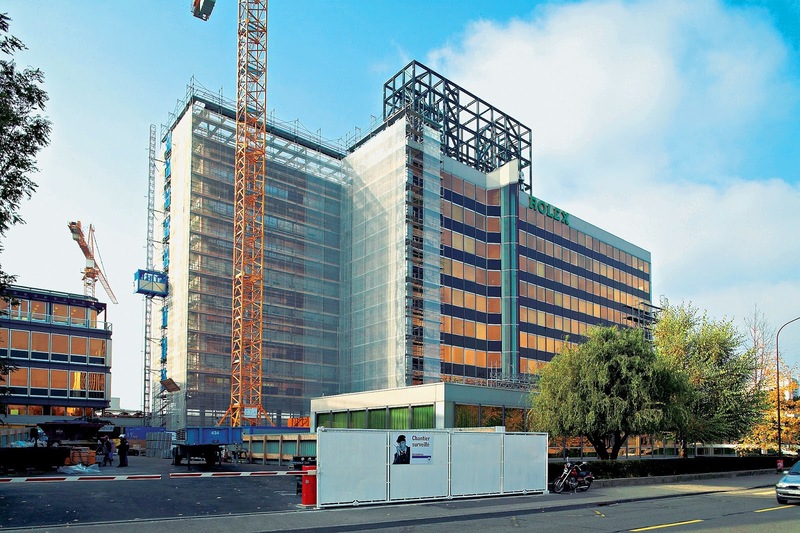 The Rolex Board of Directors decided to build a new building that met Rolex's growing requirements, and they chose to do this in the Praille-Acacias canton of Geneva, which was an industrial area. Rolex chose this new location in an industrial neighborhood, since it was centrally located, and seemed to be the ideal strategic location. In doing so, Rolex once again decisively broke with the Genevan watchmaking industry tradition, which had always placed production sites along the banks of Lake Geneva. "Rolex is no longer a manufacturer steeped in ancestral tradition, but has asserted itself as belonging resolutely to the modern industrial world." "Design and construct a building whose exterior exemplify distinction, precision and efficiency." 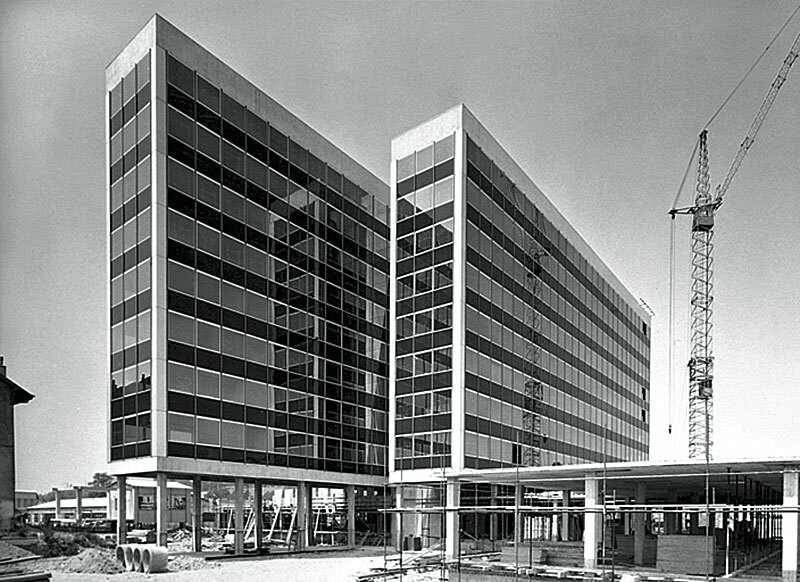 The new Rolex World Headquarter building was inaugurated in October of 1965, and consisted of two parallel eight-storey towers, that were shaped like an "H". This utilitarian "H" shape was selected to provide optimal daylight conditions. The new Rolex towers were partially surrounded with beautiful ponds that were designed to pay homage to Lake Geneva, as well as reflect the legendary Rolex "Oyster" case. "First we shape our dwellings, then our dwellings shape us." 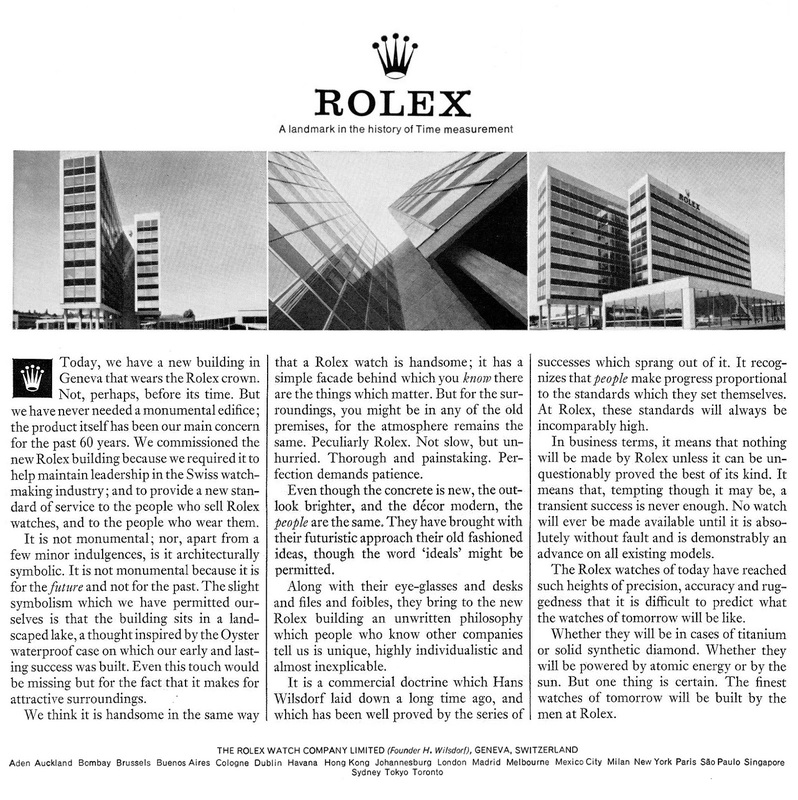 The following two Rolex ads appear courtesy of the Concannon Collection and they offer insight into how proud Rolex was of the development and design of their new World Headquarters in Geneva. "The Rolex watches of today have reached such heights of precision, accuracy, and ruggedness that it is difficult to predict what the watches of tomorrow will be like. Whether they will be in cases of titanium or solid synthetic diamond. Whether they will be powered by atomic energy or by sun. But one thing is certain. The finest watches of tomorrow will be built by the men at Rolex." 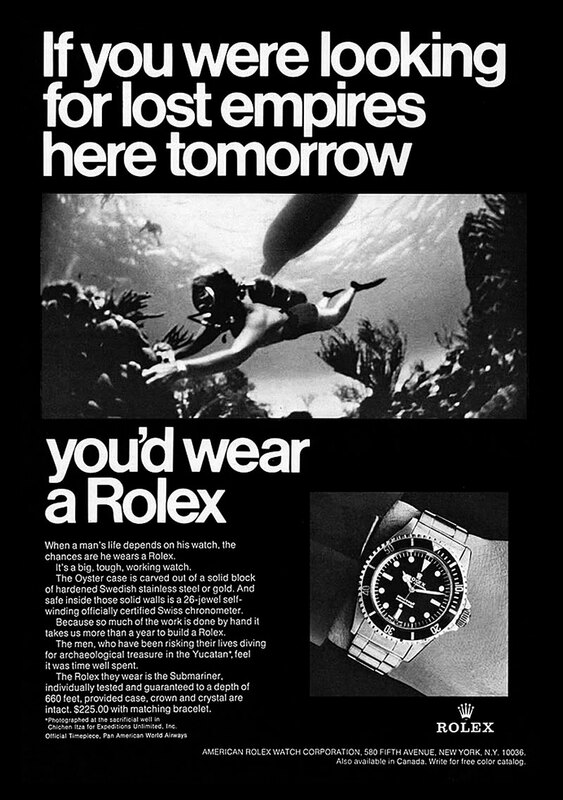 The following fascinating Rolex advertisement was published in a magazine in January of 1973, more than 40 years ago. 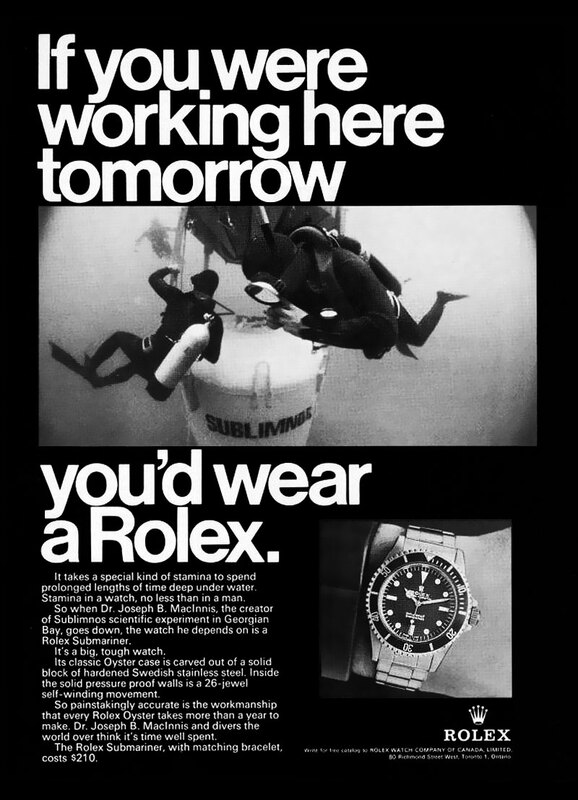 It is amazing how much Rolex advertising has changed over the last half century. 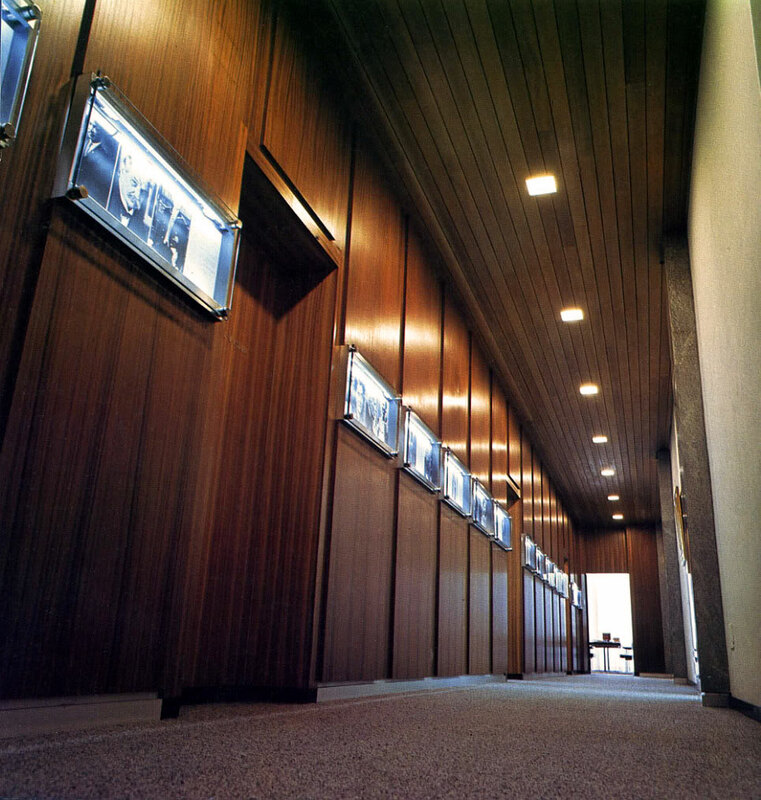 Here is a higher-resolution photo of the executive offices at Rolex Headquarters in Geneva in 1973. 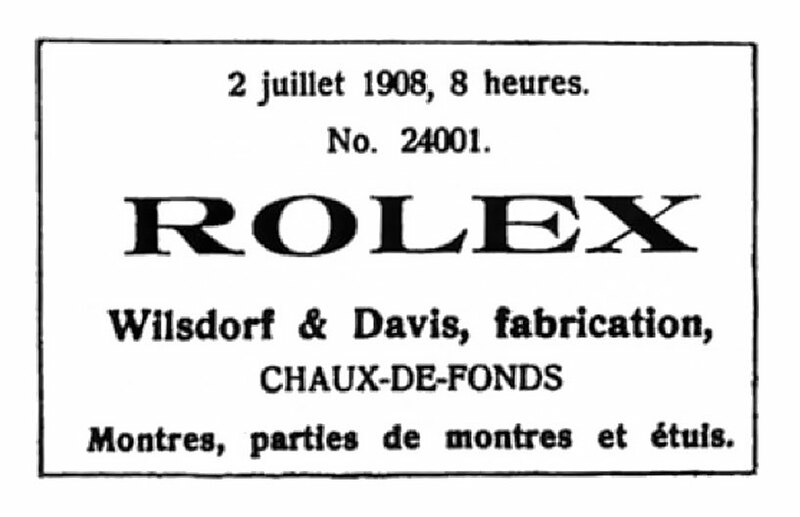 It is clear, that at least back in 1973, Rolex was very proud and interested in their history. What I want to know, is where are all those photos today? 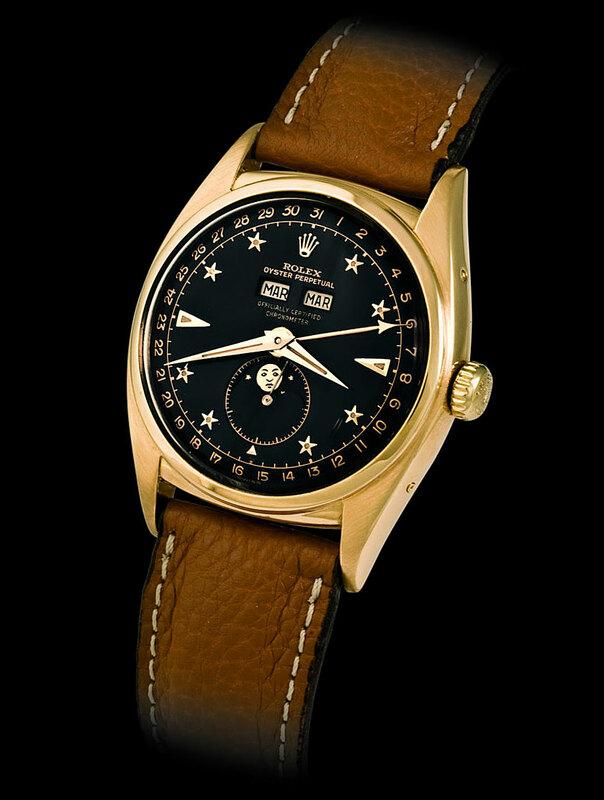 I want to see them and learn more about this amazing piece of Rolex history! 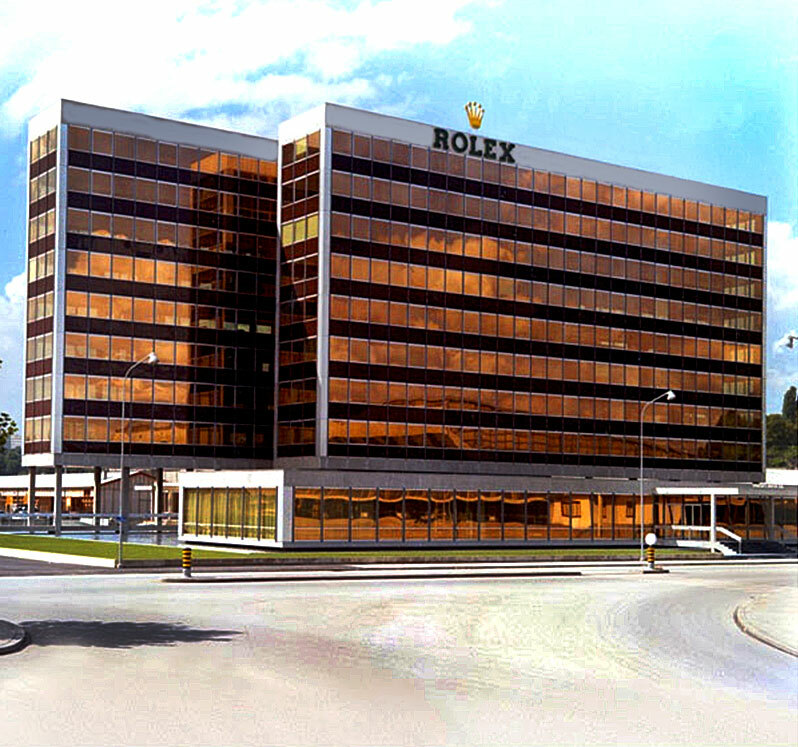 The photo below shows Rolex headquarters in 1965, and as you see it had an orange mirror-like glass facade coupled with exposed concrete. Rolex kept growing and becoming more successful. By 1975, after the Rolex towers were erected, they were being used at full capacity. 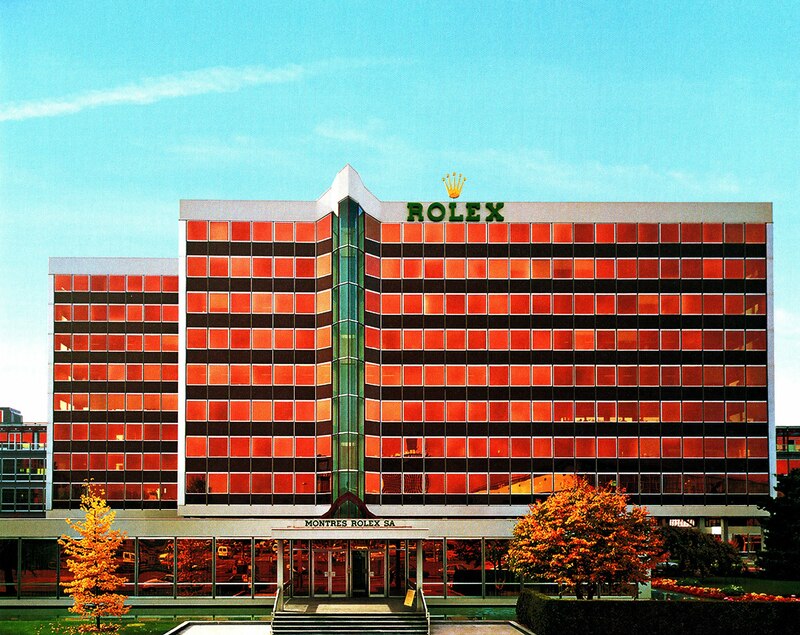 Between 1978 and 1995 following rapid expansion, Rolex once again made plans to enlarge their World Headquarters, and Rolex Building 3, and Rolex Building 4 were constructed. 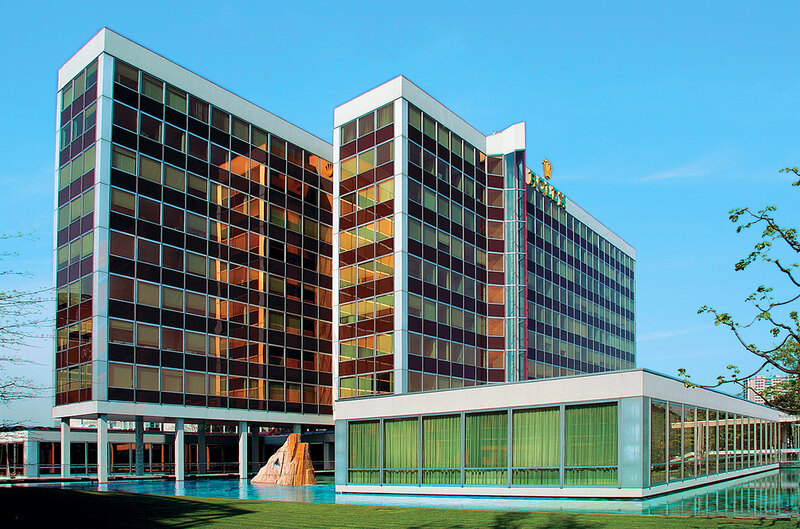 In 1984, as seen below, Rolex added a panoramic elevator to the facade, which is really impressive to look out of as it faces Lake Geneva. In 1997, Rolex hired the Genevan architectural firm of Brodbeck & Roulet to overhaul and expand their world headquarters up toward the heavens. This expansion took place toward the end of the André Heiniger leadership reign. 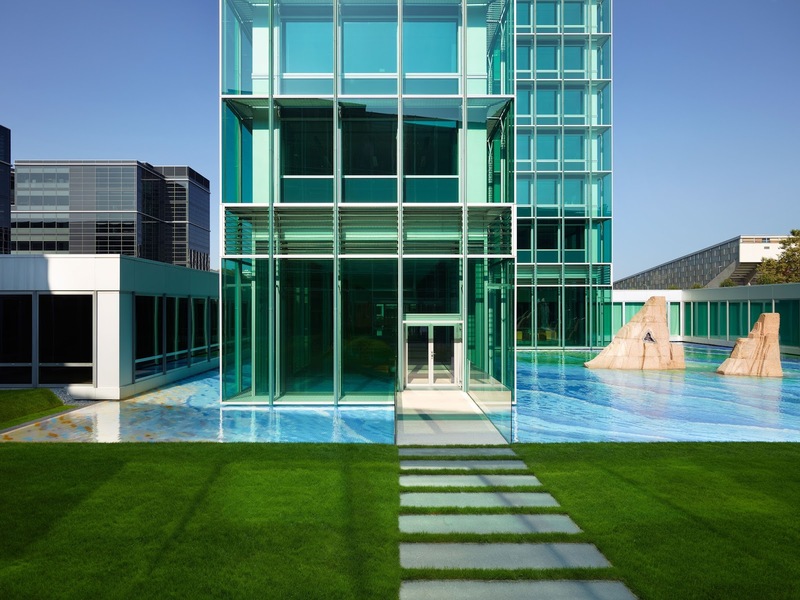 Rolex World Headquarters received a dramatic overhaul, which added three additional floors that include an open atrium style executive penthouse floor with a glass ceiling. The photo below shows the building expansion that added the beautiful panoramic rooftop terrace. This amazing architectural transformation included building a new timeless green glass facade/veneer which gave the building an ultra-modern Bauhaus look, while incorporating Rolex's trademark green identity color into the mix by using solar Parson tinted glass. This amazing metamorphosis began construction in 2002 and was completed in 2006. If you look closely at the photo below, you can see the original Rolex building pictured above, encased in the new structure. Being a student of architecture, I have to say this is a truly remarkable and dramatic achievement. I could not help but notice that everywhere I turned, inside and outside Rolex headquarters, everything was visually stimulating and beautifully groomed. 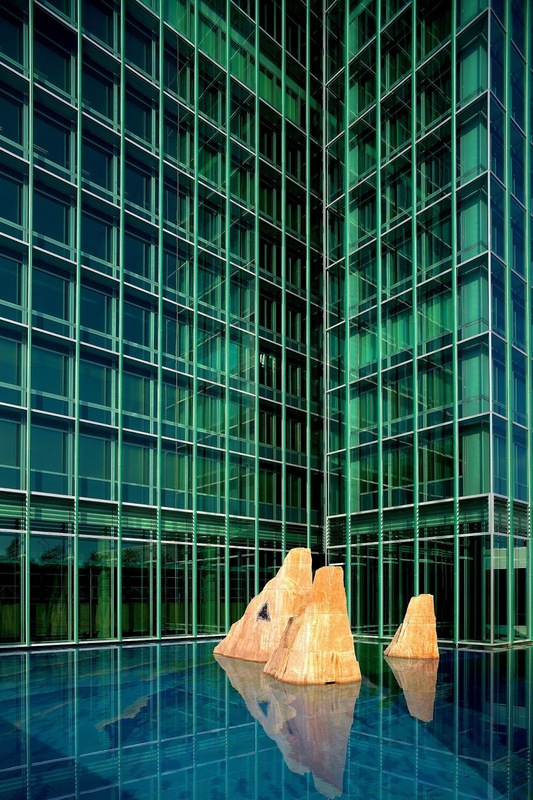 In the photo below you get a close-up look at the distinguished green glass facade of the Rolex World Headquarters. The interior design of Rolex Headquarters was absolutely stunning. I noticed it was beyond immaculate, and every single element was visually spectacular, in a timeless/modern way. 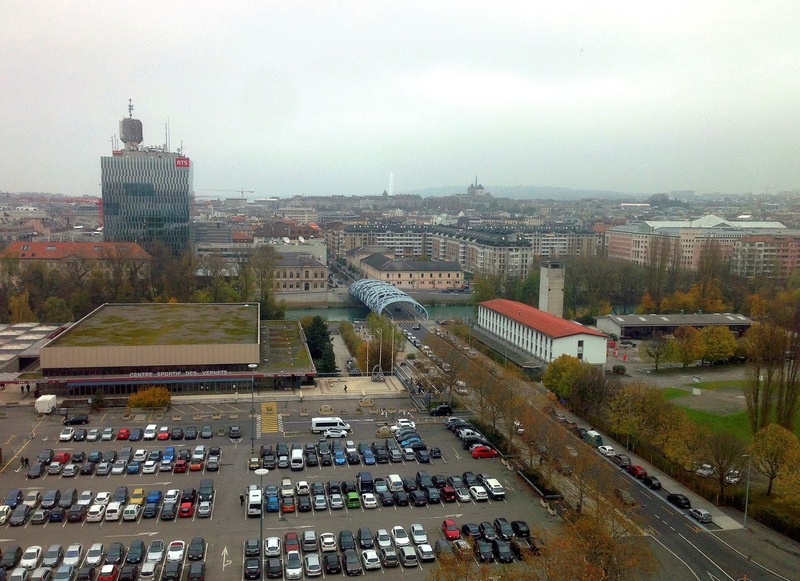 I took the photo below out of the window of Rolex World Headquarters, which shows the Hans Wilsdorf Bridge, and if you look closely you can see the Jet d'Eau Geneva Fountain in the background, which is one of the biggest fountains in the world. 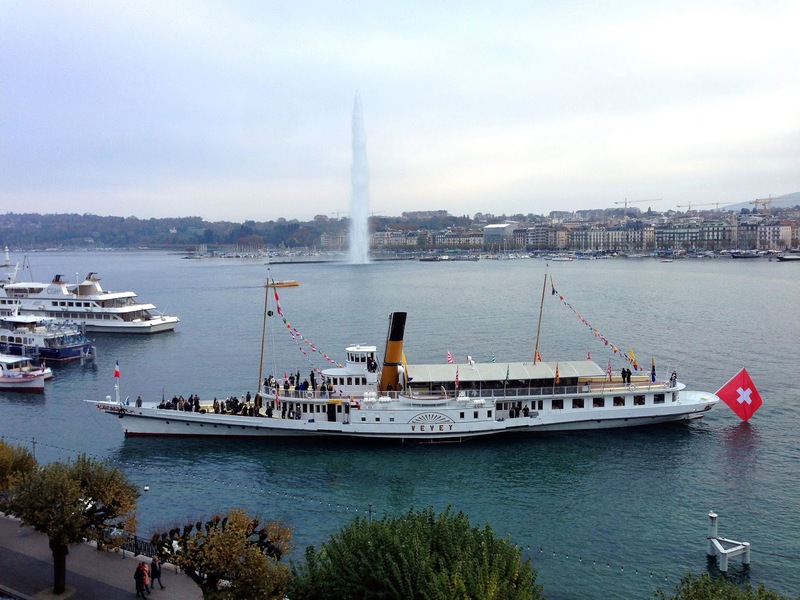 The Jet d'Eau is located where Lake Geneva empties into the Rhone River and it pumps 132 gallons (500 liters) of water per second up to an altitude of 459 feet (140 meters). This is the same fountain that I shared earlier in the story in the photograph of Lake Geneva. 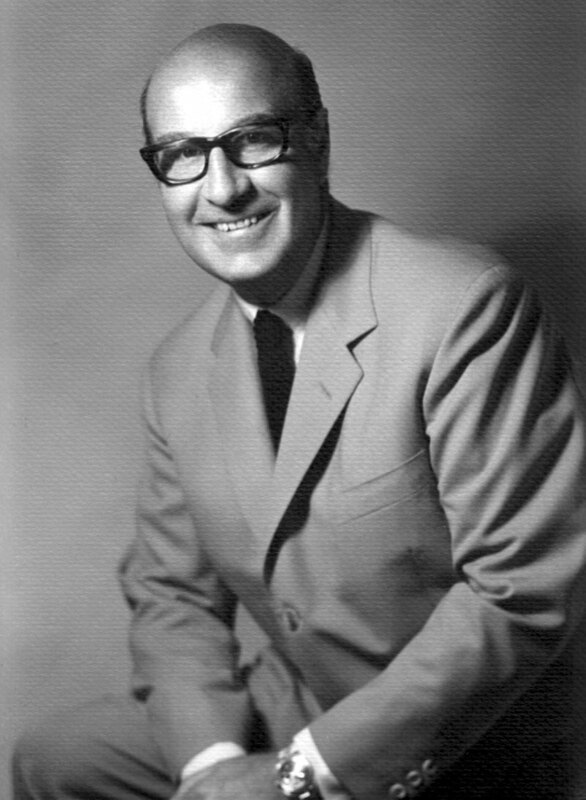 Patrick Heiniger was Andre Heiniger's son, and before joining Rolex he practiced law in the United States. Perhaps Patrick Heiniger's greatest contribution to Rolex was in having the vision, wisdom and drive to consolidate all their operations down from 19 factories to only four, of which 3 are located in Geneva, and the fourth is located in Bienne, Switzerland. "The stars of Rolex are the timepieces, not the directors." Patrick Heiniger believed it would make sense to try to make Rolex more successful in the women's market. 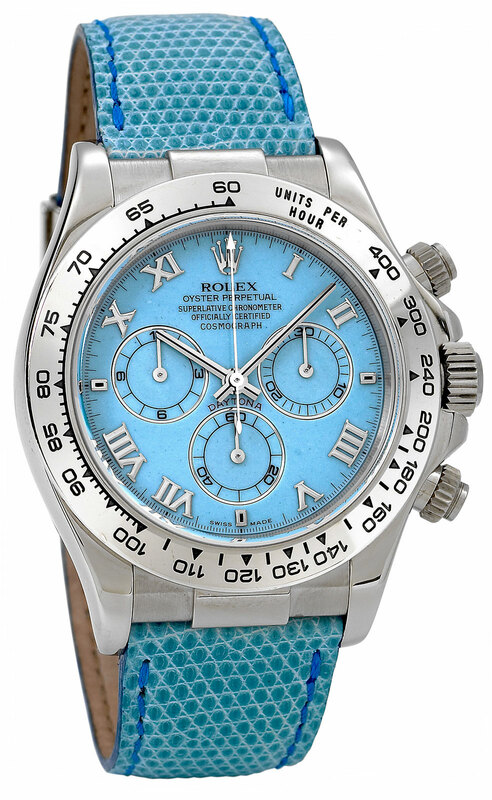 In the late 1990s Rolex surprised the watch world, when they introduced a full size men's 40MM Daytona model made for women, which is commonly referred to as "The Beach Daytona". This model came in four feminine pastel colors, and featured lizard-skin straps that matched the mother-of-pearl dials, which featured raised white gold Roman numerals. For the first fifteen years of Patrick Heiniger's tenure as CEO of Rolex, there were not many new model introductions, but in 2003, Rolex introduced one of my absolute favorite models, which was known as a 50th Anniversary LV Rolex Submariner. LV stands for Lunette Verde, which means Green Bezel in French. 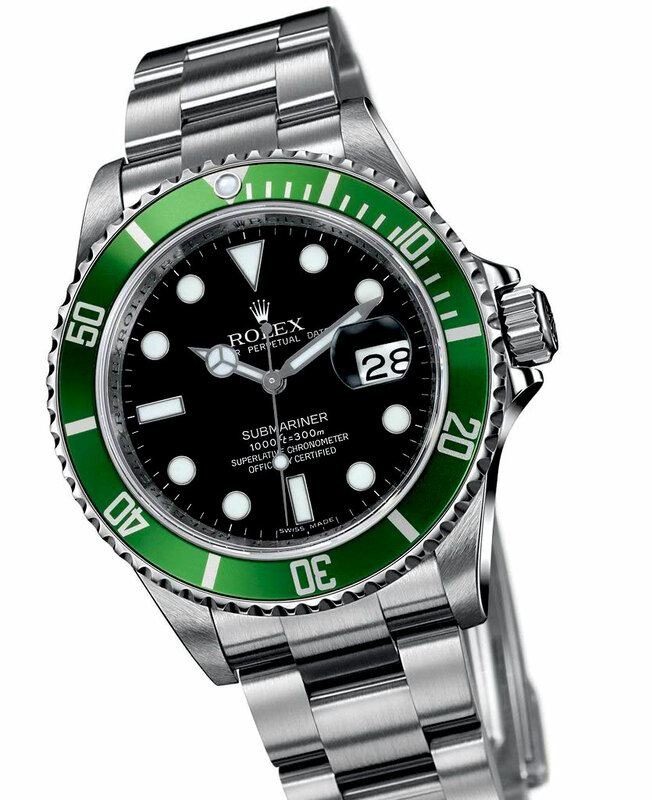 The 50th Anniversary Rolex LV Submariner represented in many ways, a return to Rolex's design Roots. 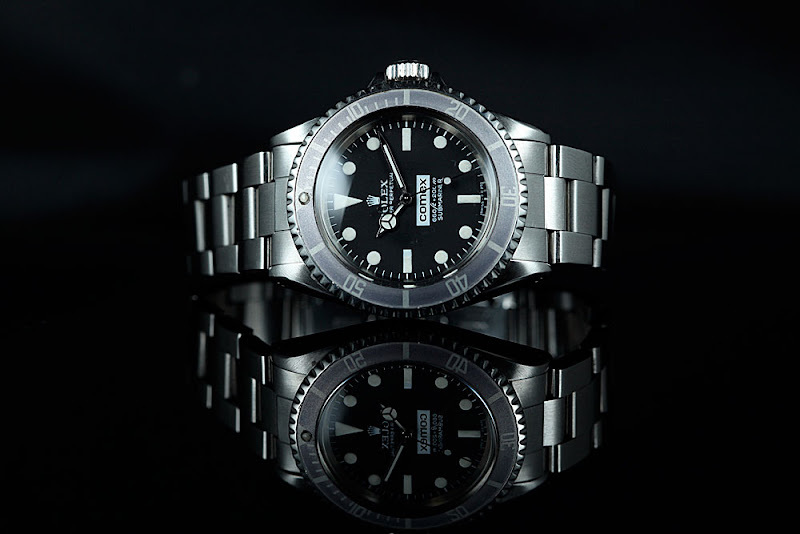 Specifically, the LV Submariner brought back the much larger "Maxi Markers", which gave the classic black bezel Submariner, a much bolder/more aquatic look. The LV Submariner also had what are known colloquially as "Fat Hands", which also gave this model a more masculine vibe. Or course the most interesting feature of the original LV submariner is the Green Bezel insert, which was a radical departure from the standard black bezel insert. 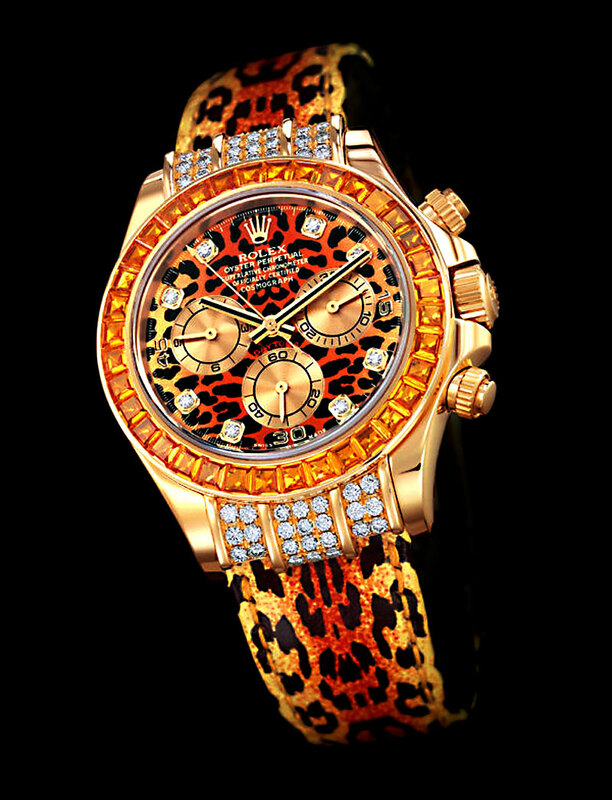 In 2005 Rolex introduced another specialty ladies Rolex Daytona model, known as the "Leopard Daytona", which as you can see in the photo below is way over the top stunning. In 2007, toward the end of Patrick Heiniger's tenure there was a flurry of new model introductions. "The Yacht-Master II is designed to meet the needs of professional sailors. The regatta chronograph features the world's first programmable countdown with a mechanical memory. It provides precise synchronization with the crucial starting sequence of a yacht race." 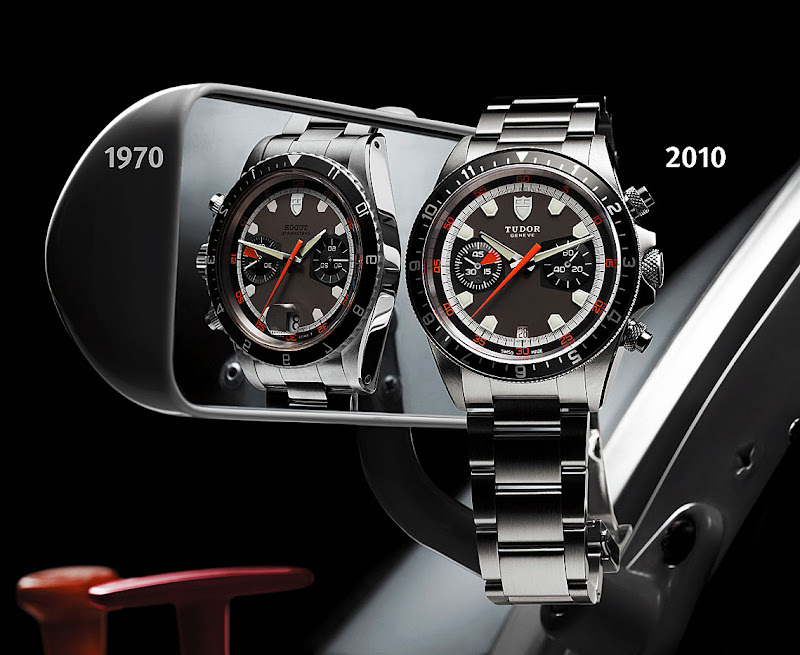 Also, at Baselworld in 2007 Rolex re-introduced the Rolex Milgauss which has a special anti-magnetic case, and movement. 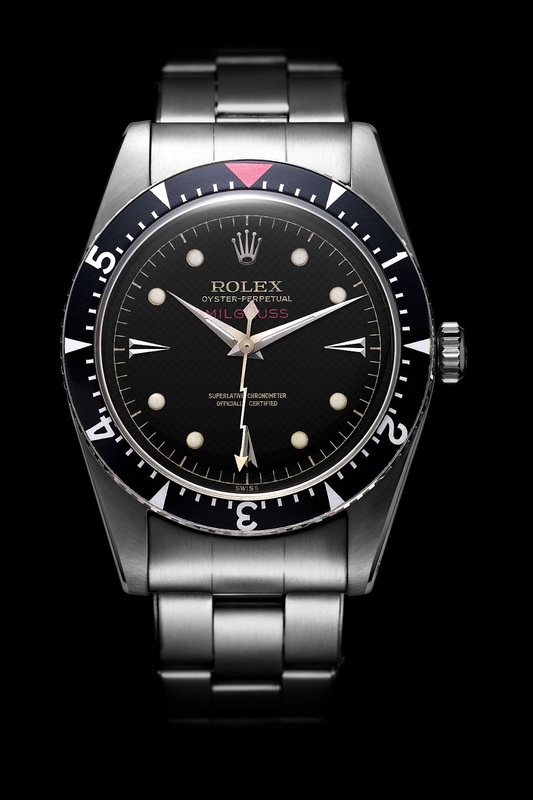 Rolex made a special model to commemorate the 50th Anniversary of the Milgauss, known as the GV, which is seen below. The Rolex GV Milgauss featured a special green crystal. 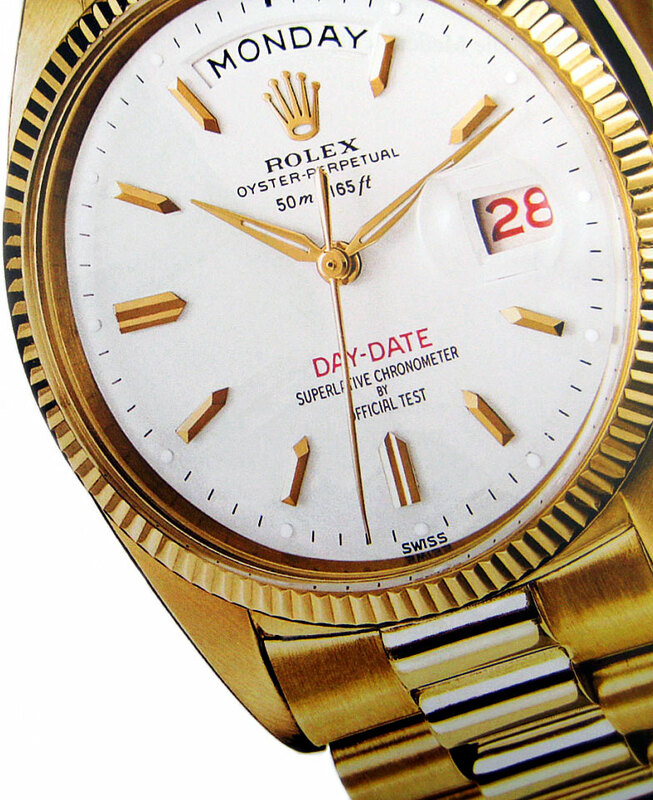 In 2008 Rolex surprised everybody when they introduced the 41MM Rolex Day-Date II. 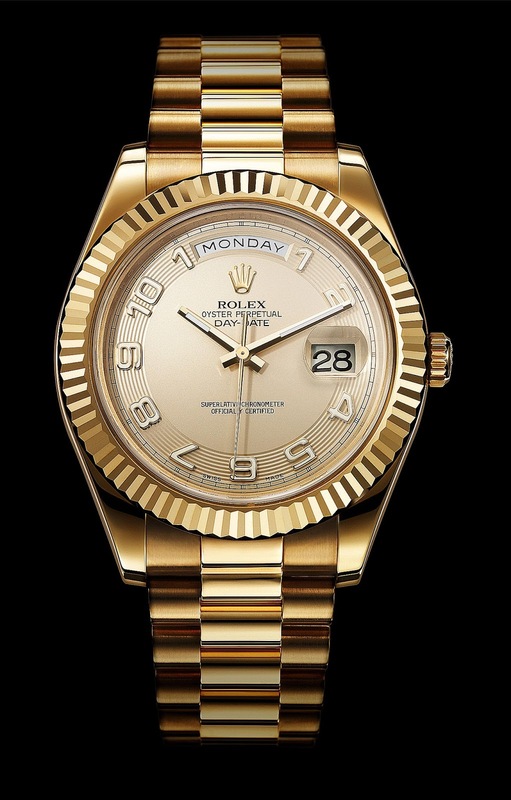 The Day-Date II, was a significantly updated version of the classic 36MM Rolex Day-Date. In 2008 Rolex also caught the world off-gaurd with the launch of the Rolex DEEPSEA SEA-DWELLER, which was an over-the-top, DEEP-SEA diving watch, which came in a 44mm case. 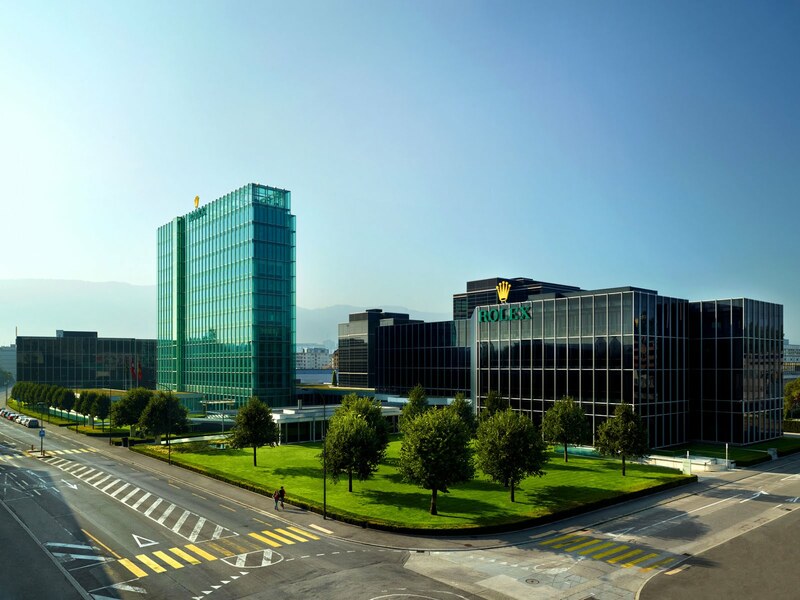 "Preserve its unique status in the watchmaking industry, and in keeping with the pioneering and dynamic spirit, the Rolex Group chose to break with the past in another way, by making a strategically fundamental change: the vertical integration of its Swiss suppliers. In Geneva, this choice led to the decision to consolidate all activities of the Group at the three large sites: Acacias, Chêne-Bourg, and Plan-les-Quates"
Reducing 19 factories down to 4 allowed Rolex to Achieve serious economies of scale and motion. In essence, this vertical integration was Rolex's Declaration of Independence, as it was no longer dependent on outside sources for anything except raw materials, which are commodities. "The past is the past. 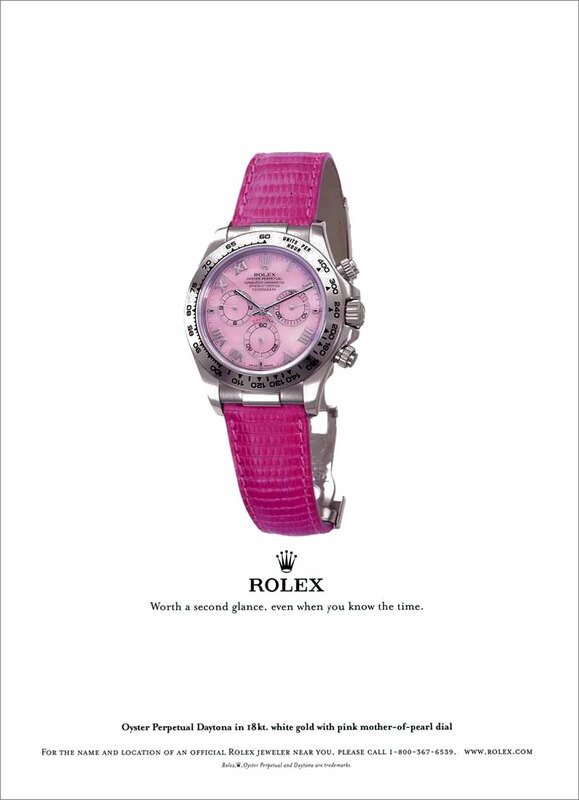 Rolex is finding new ways of thinking and doing. In the pursuit of excellence, we are making bold changes, while preserving the best of our tradition as we explore new horizons." At the start of the 21st century, we made a strategic decision to ensure our autonomy and maintain control over the essential components of our watches. We integrated our Swiss suppliers into the Group, and consolidated our Geneva activities at three new sites in buildings that exemplify state-of-the-art technology. To enhance the quality of our products, we have also industrialised our production process. This decision marks an unparalleled and fascinating chapter in our history. This daring initiative puts us ahead of our time and reflects the spirit of enterprise that has led to our success." 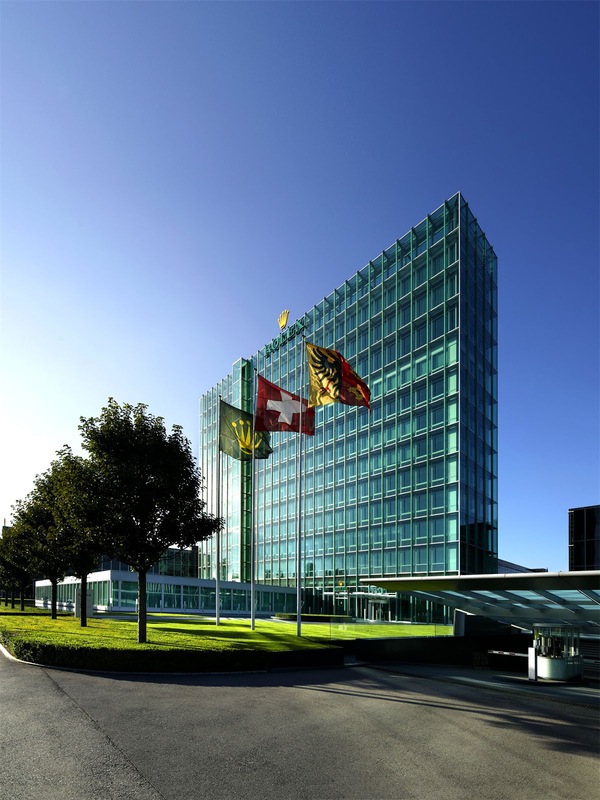 These impressive buildings strengthen our presence in Geneva and in Switzerland, and are part of an ambitious long-term vision: to heighten the universal and international sta- ture of the brand. The buildings, far from being a goal in themselves, are an achievement that will inspire us to reach greater heights in the future. This collective achievement, completed in record time with first-rate partners, is symbolic. The buildings are a symbol of both our roots and the perpetual re-affirmation of fundamental values. In a competitive and constantly evolving world, only a determination to take on the future can lead to continuing success." Patrick Heiniger also developed the Rolex Protoge & Mentor program, and during his tenure. Patrick was a heavy cigaret smoker and one day he had a really soar throat, that kept getting worse, so he went to the doctor, and was diagnosed with cancer. He immediately returned to Rolex and resigned so he could focus all of his energy on trying to overcome his illness. Several years later, he passed away. The Heiniger contribution is highly revered and respected at Rolex, and Patrick leaving left some big shoes to fill. Patrick Heiniger's sudden exodus caught everybody at Rolex by surprise, and after all, the Heiniger dynasty ruled Rolex for 45 years, which was only 10 years less than Hans Wilsdorf. At the time of Heiniger's abrupt departure, Bruno Meier was the Chief Financial Officer of Rolex. The Rolex board voted to appoint him as the CEO until they could find the perfect candidate to replace Heiniger. 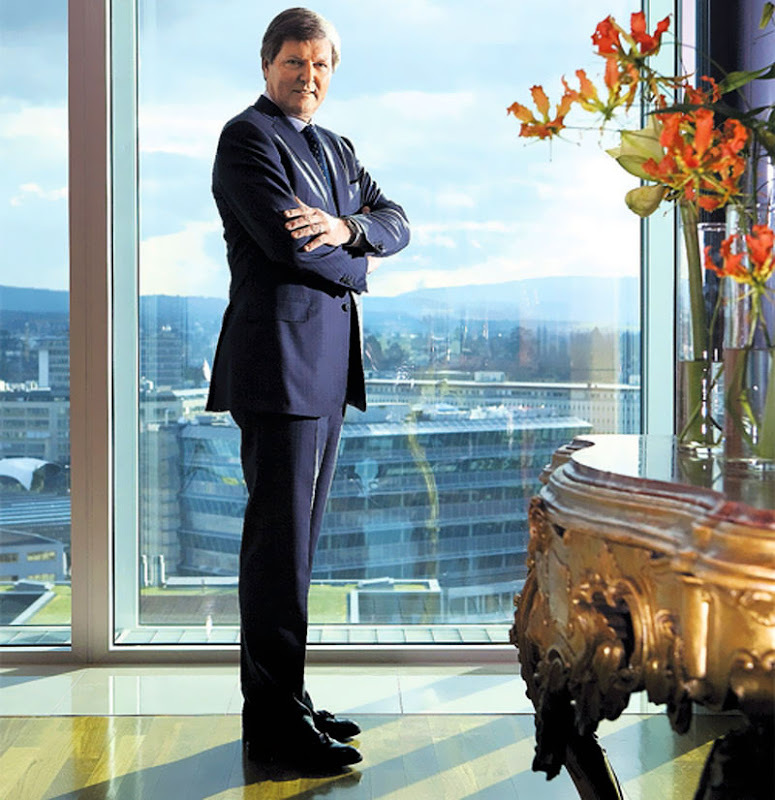 Bruno Meier carefully steered Rolex for three years, until Rolex could find a long-term leader. Under the leadership of Bruno Meier, Rolex introduced the all-new 41MM Rolex Datejust II in 2009, which was based upon the original 36MM Datejust. 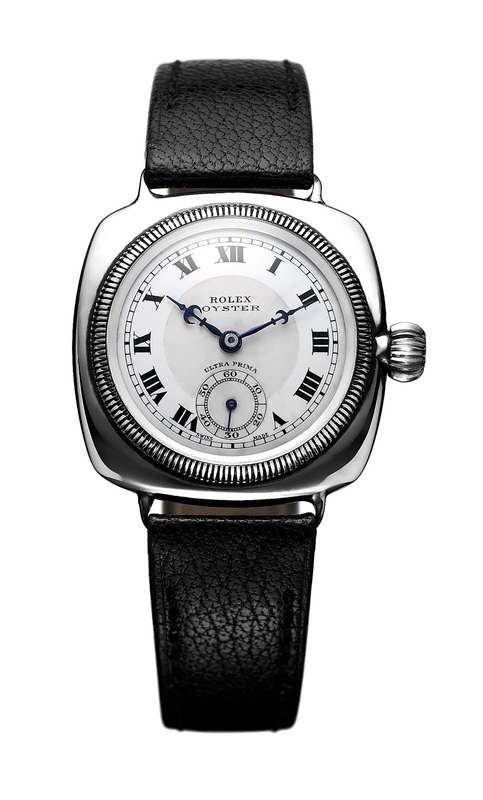 "Equipped with unparalleled industrial and technological means of production, now being further developed by a new construction project, and rich in a history of major innovations like the mythical Oyster, in 1926, the first waterproof wristwatch, Rolex has the privilege of being able to give free rein to its creative potential. The company takes full advantage of its complete autonomy to innovate and reinterpret with continuity the fundamental principles responsible for the success of its watches. 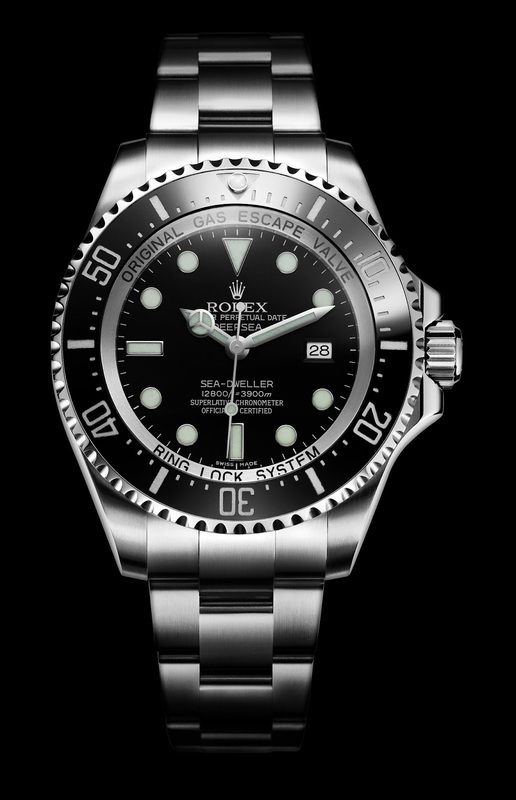 "This approach has been applied this year to the Submariner, the Explorer and the Datejust. These models, each with a unique identity, are recognized around the world as unsurpassable, timeless symbols of a certain art de vivre. They are presented in new versions drawing on the vast Rolex heritage and honoring the passion for perfection proper to our brand." 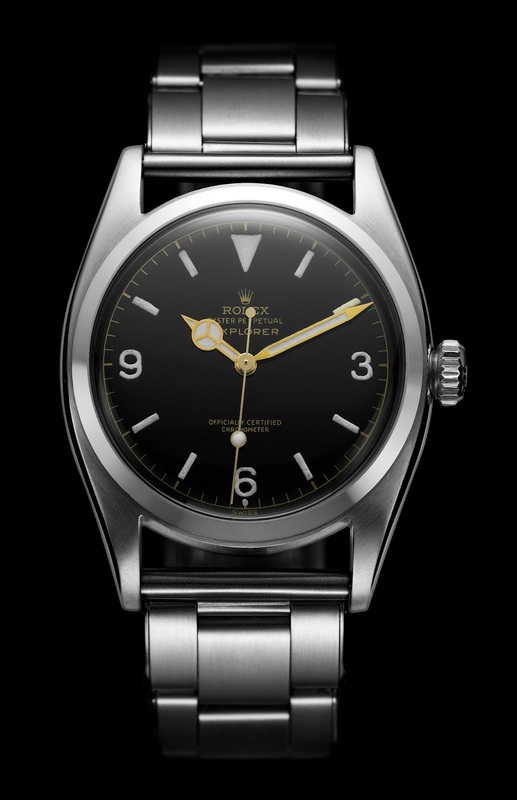 In 2010 Rolex introduced the significantly updated 39MM Rolex Explorer model, which grew 3MM from the original 36MM model Rolex made since 1953. 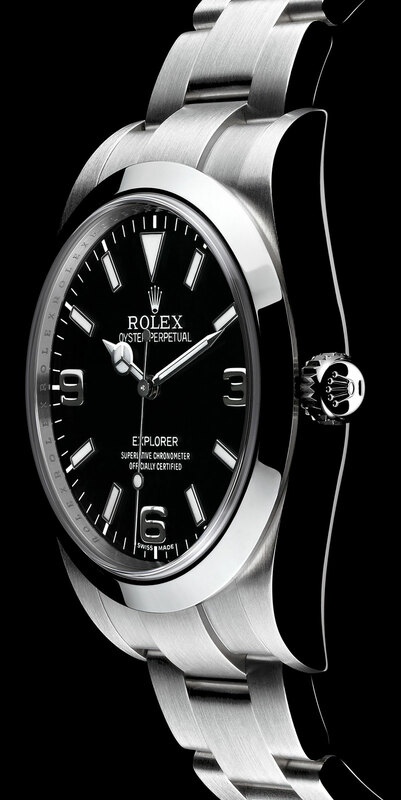 To commemorate this all-new Explorer model, Rolex produced the really cool and inspirational video seen below. 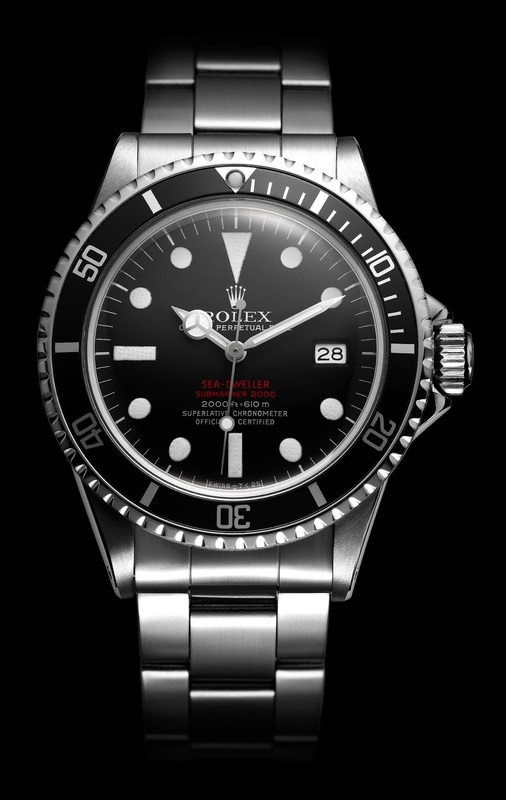 Also in 2010 Rolex introduced an all-new, long-awaited stainless steel Rolex Submariner, which incorporated the "Supercase", along with "Maxi Markers", and "Fat Hands." This amazing new Submariner model also incorporated the revolutionary, all-new Rolex Glidelock Bracelet, as pictured below, which allows the wearer to micro-adjust the bracelet so it always fits perfectly. The most amazing characteristic of this bracelet, is that it can be adjusted on the wearers wrist, without having to be removed from their wrist. 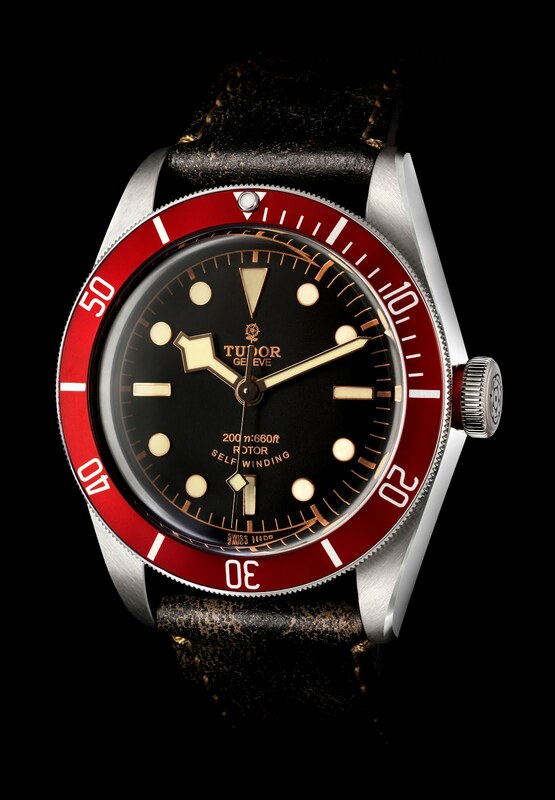 In 1952 Rolex founder, Hans Wilsdorf built a brand named Tudor, which is still owned by Rolex today . In 2010, Rolex reinvented the Tudor brand when they introduced the all-new Tudor Heritage Chronograph, which is pictured below. 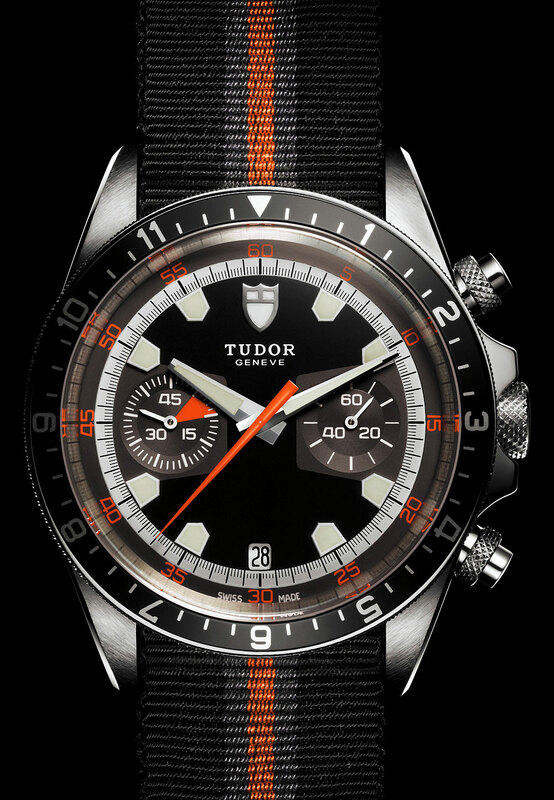 The Tudor Heritage was based upon a Tudor model which was nicknamed The Monte Carlo, by collectors, which was made in the early 1970s. The video below is an awesome commercial that Rolex created to introduce the all-new Tudor Heritage Chronograph. In 2011, at the end of Bruno Meier's reign, Rolex introduced the super-cool 42MM Rolex retro Orange Hand Explorer II, as seen below. 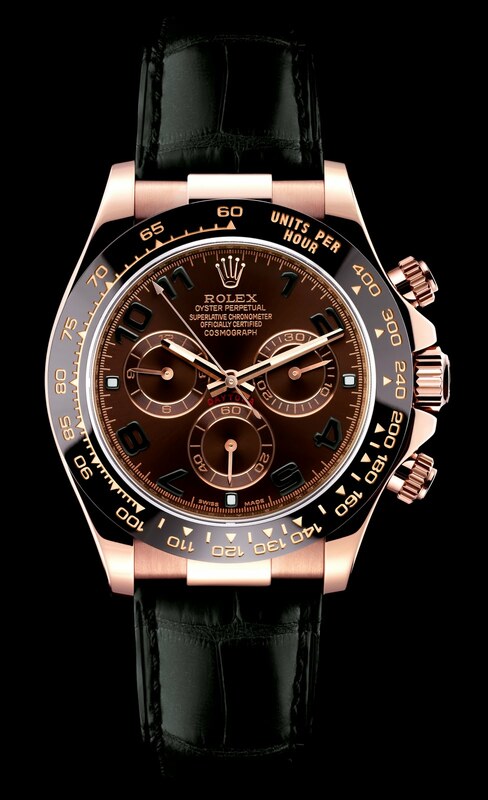 Also, in 2011 Rolex introduced the first Daytona model with a ceramic bezel, as seen below on this Everose gold body. 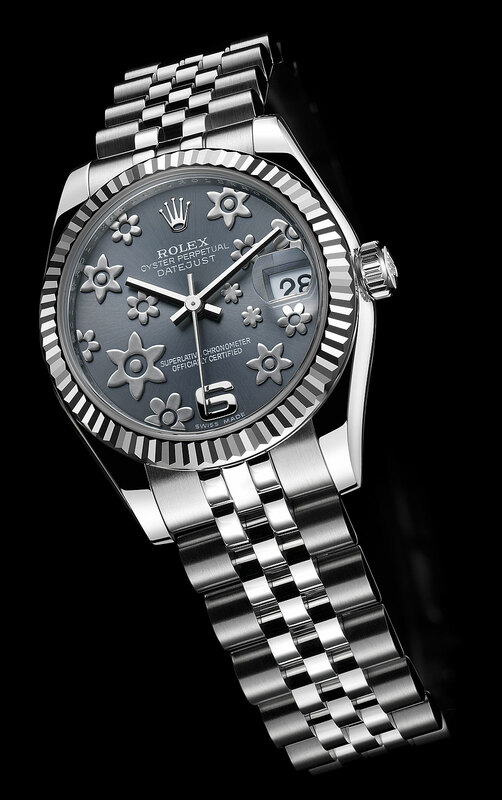 In 2010, under Bruno Meier's leadership, Rolex introduced a white Rolesor Datejust Lady in 31MM which features the beautiful "Flower Power" dial, as seen below. 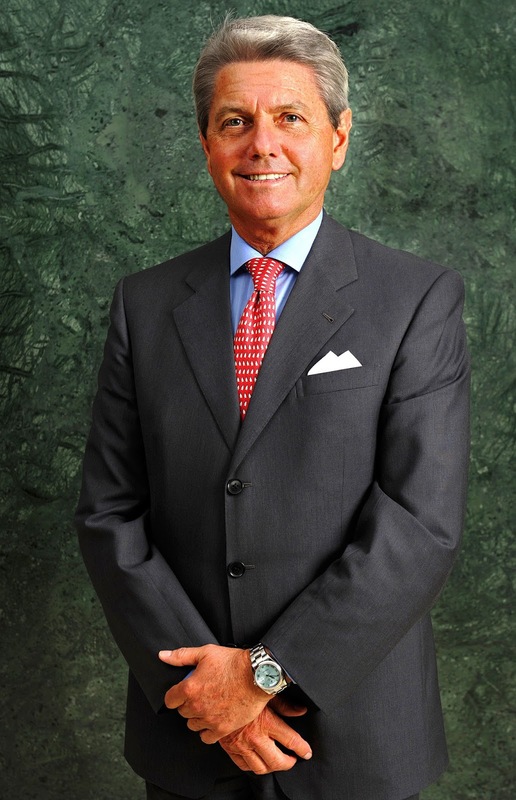 Gian Riccardo Marini is the current CEO of Rolex and has worked for Rolex for over 40 years. Mr. Marini began his career working for Rolex in Italy, where he was born, and I believe his father also worked with Rolex. 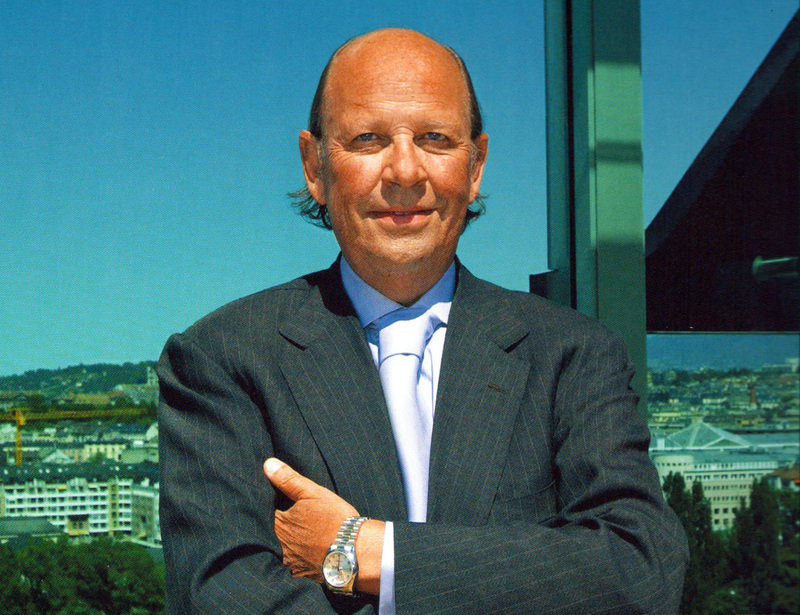 Under Mr. Marini's tenure, it appears Rolex is stronger than ever and poised well for a magnificent future. Mr. Marini has impeccable timeless style, and appears to be the living embodiment of Rolex. 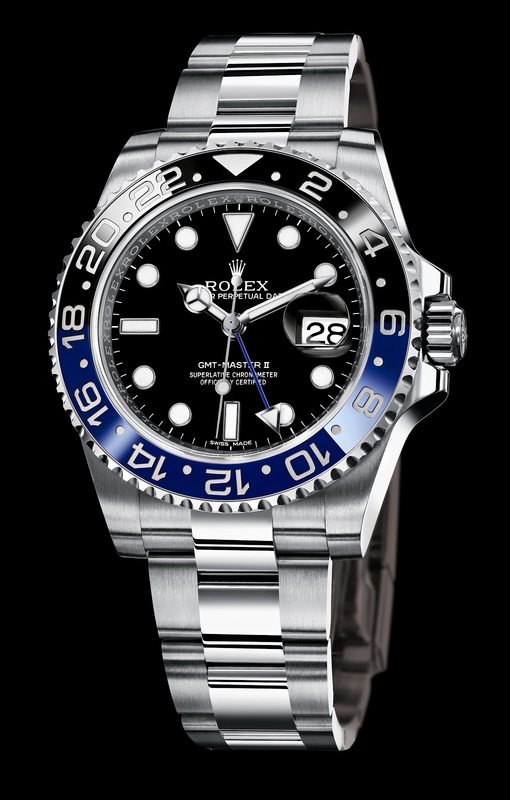 It also appears that since he took the helm that Rolex, there has been a re-birth of the brand. 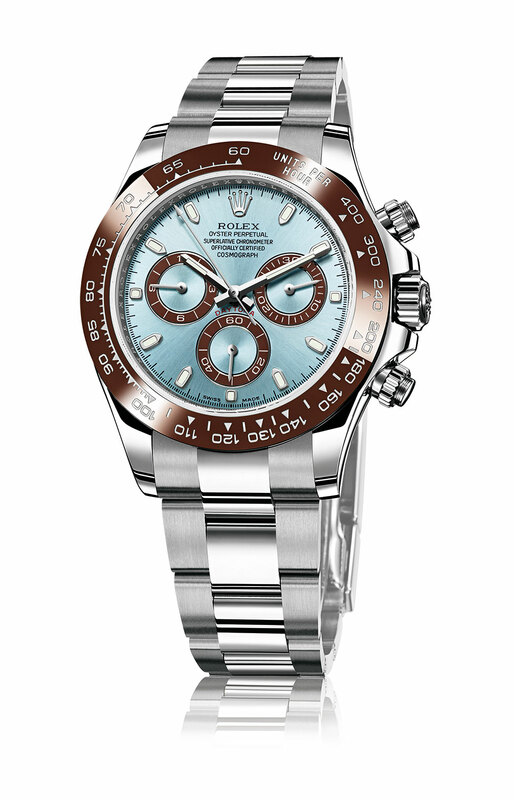 Under Mr. Marini's leadership, Rolex launched a completely new 42MM model in 2012, known as the Rolex SKY-DWELLER. 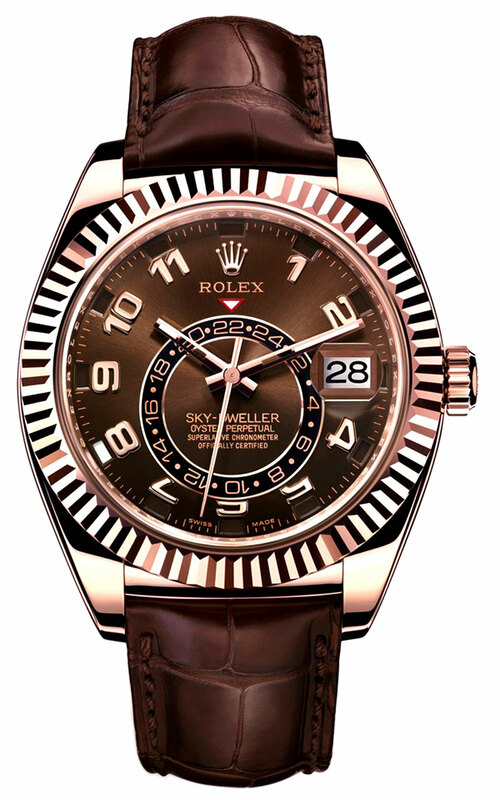 The nomenclature of this completely new model "SKY-DWELLER" is likely a play on Rolex's "SEA-DWELLER", as well as the unusual "SPACE-DWELLER", which Rolex made for a short time in the early 1960s. "A technological masterpiece protected by 14 patents, the Oyster Perpetual Sky-Dweller provides the information global travelers need to keep track of time at a glance. Launched in 2012, the Sky-Dweller is a compelling timepiece of revolutionary design that blends to perfection mechanical sophistication and ease of use." In 2012, Rolex also surprised the world by launching a 40MM with a cobalt blue starburst dial, which is stunningly beautiful. Also, in 2012, Rolex introduced another very cool Tudor model that built on the success of the Tudor Heritage Chronograph, which was introduced two years earlier. This new model paid homage to past heritage with the introduction of the Tudor Heritage Black Bay, which his pictured below. 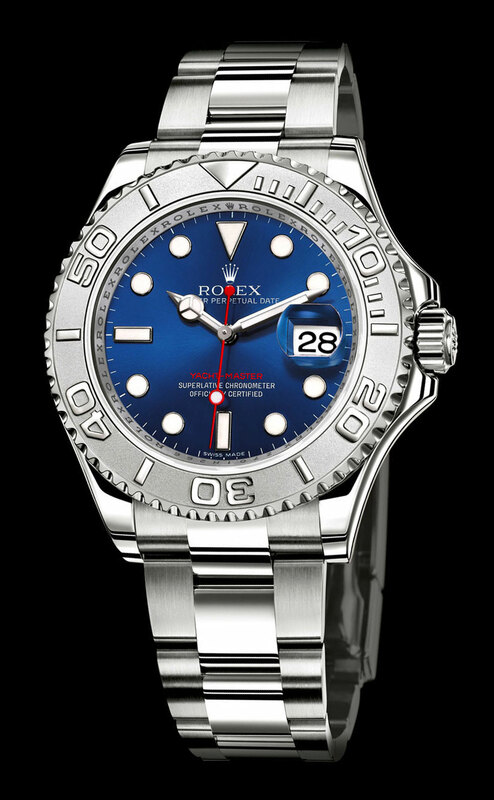 Last year in 2013, under Mr. Marini's leadership, Rolex introduced a Rolex GMT-Master II model with a black and blue Ceramic Bezel insert, which was 40MM. Rolex referred to this as the Night and Day bezel since the blue hours are the daylight hours, and the black are the nighttime hours. 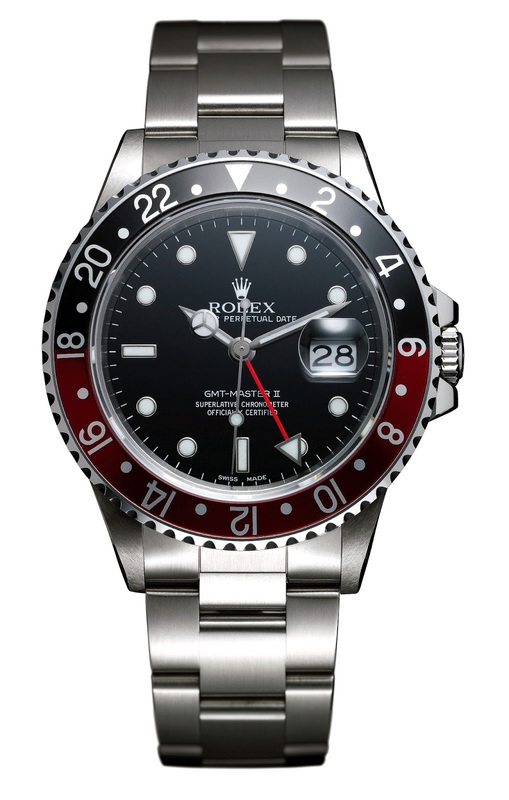 This model represents another Rolex first, as it is the first ceramic bezel insert that has two colors. Also, last year in 2013, under Mr. Marini's leadership, Rolex introduced the 50th Anniversary Rolex Daytona, which is the first Daytona model made out of platinum. This model has an unusual sky blue sunburst dial with a dark brown ceramic bezel, and matching brown sundials.